Slowly but surely, I’m getting caught up here and I would be remiss if I didn’t post about our Canadian Christmas. It was the best of times, it was the worst of times but I’ll focus on the best. 1) Being there in the first place. 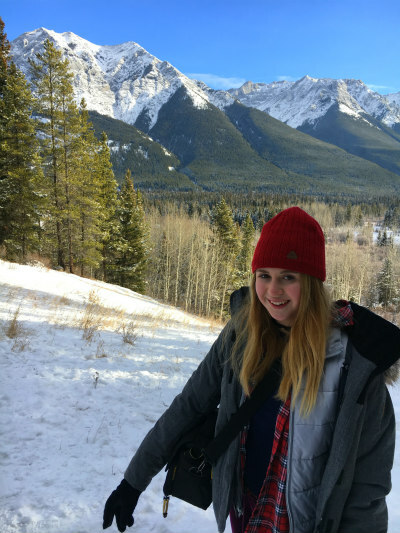 Special thanks to my friend Lisa who spotted the $300 direct flights to Calgary and to my dad who, instead of buying Christmas presents, chipped in for part of the fare. A Christmas miracle! 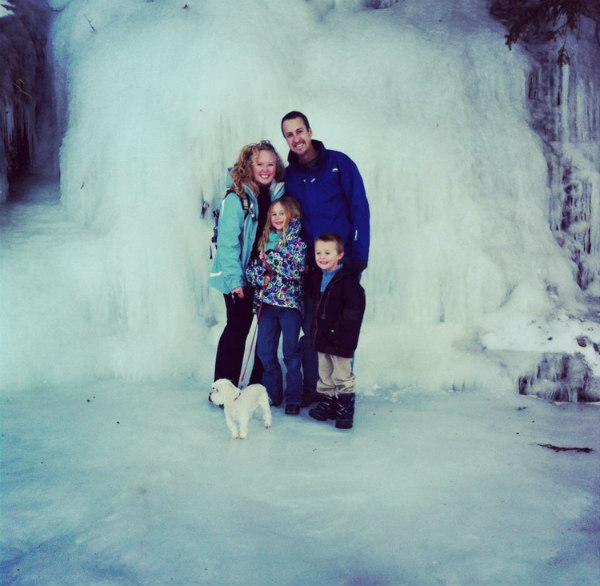 Not so miraculous: our 24-hour ordeal getting back to SLC after our flight was canceled. 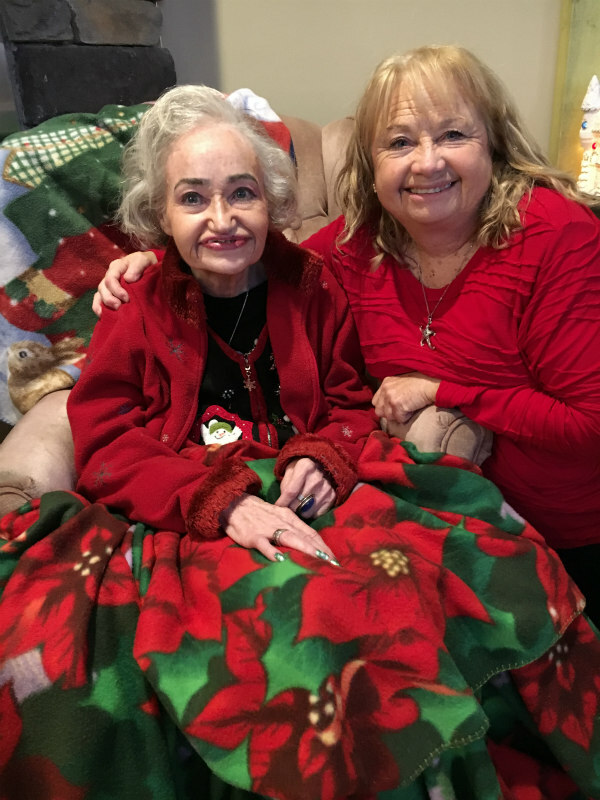 2) Being with my mom for her last Christmas at home. 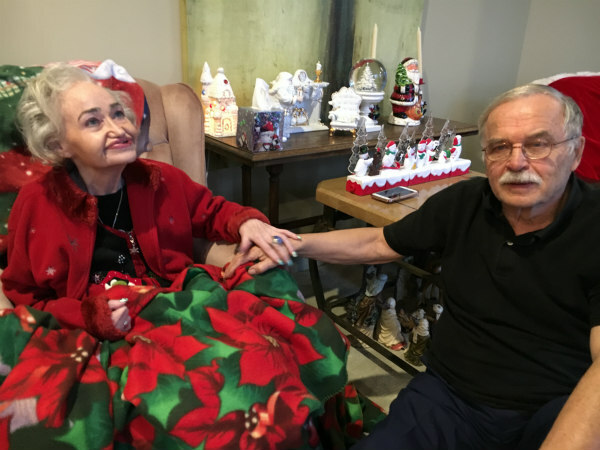 She is currently in the hospital and on the waiting list for a care facility. It has been a long time coming and we’re grateful my selfless dad has been able to care for her at home this long. She spends most of her day sleeping now but miraculously was awake for all Christmas Eve. 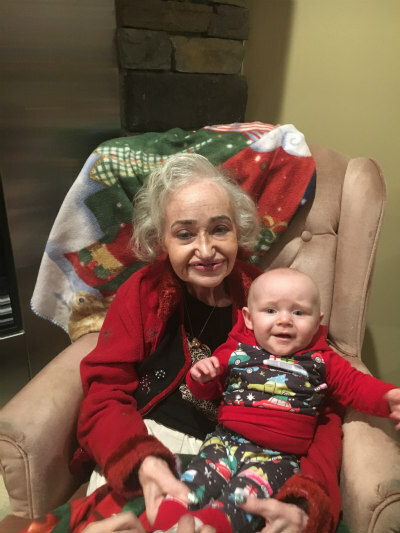 She went out for Chinese food with us one day and most moments spend with her were holding her hand, looking through her beloved Woman’s Day magazine recipes and bucolic scenes from her favorite calendar. Our final night before flying home, she was more lucid than she was the entire time we were in Canada and we saw a glimpse of that spitfire we know and love. 3) Christmas. 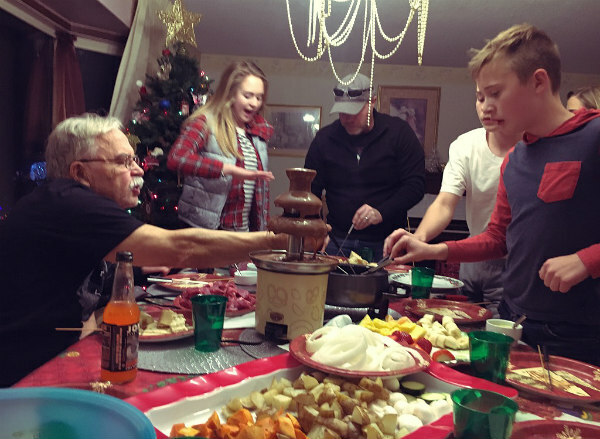 A smorgasbord of food, left-right game, bells, besting Pat in Jenga, home theatre movies (“Crazy, Rich Asians” is a new favorite), naps and matching PJS. 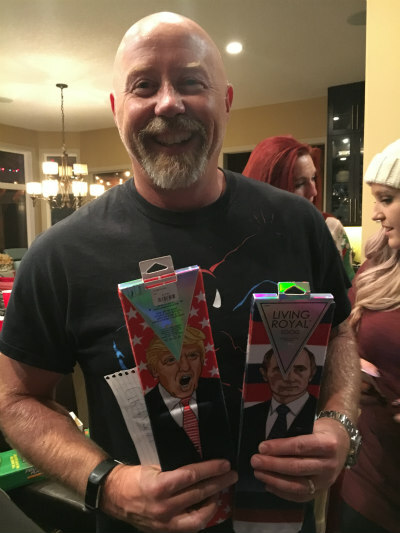 The gift exchange game was our most epic ever with three people who bought Pimple Pete (we have zit-loving issues), Jade’s camo marshmallow blowgun and Pat’s Presidents Putin and Trump socks. Borowski Family Christmas: alternately promoting chaos and world peace. 4) Ice, ice, baby. 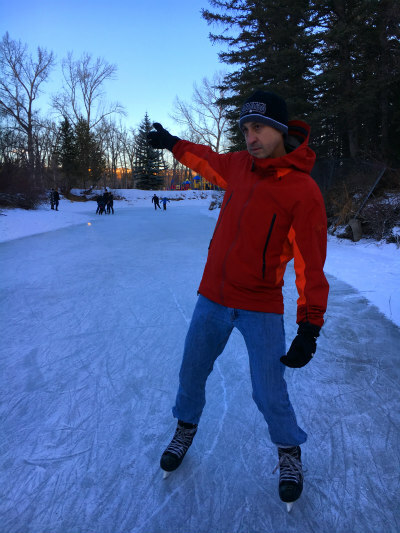 The weather was so warm leading up to our visit I had resigned myself I wouldn’t be able to do any of my favorite winter activities. 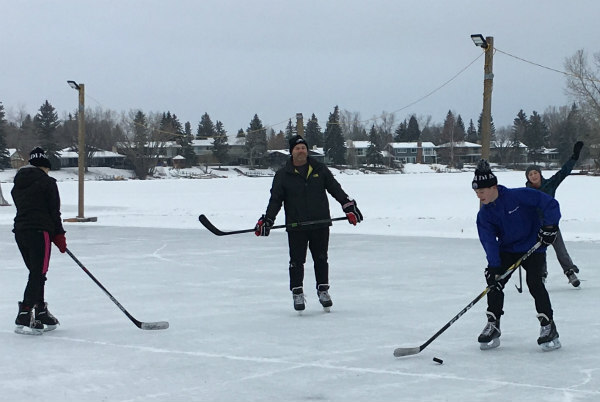 Quite unbelievably, our lakes and rivers did freeze over so we were able to play hockey with cousin Conner, my dad, Jade and a few pee wee kids at Lake Bonavista. Bode found his calling as goalie, as did I after a near concussion making a slapshot (I scored!) 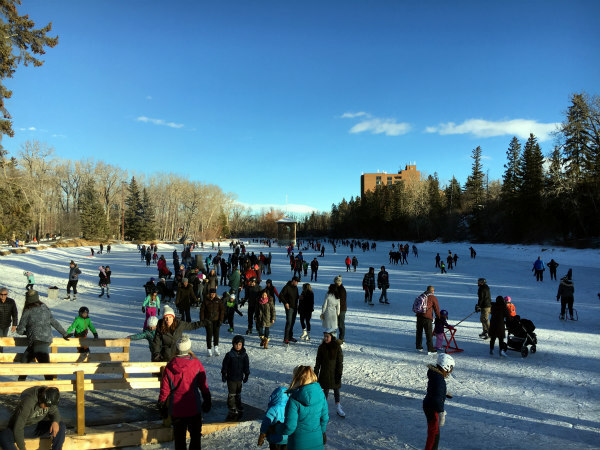 Bowness Park is a Canadian party on skates! 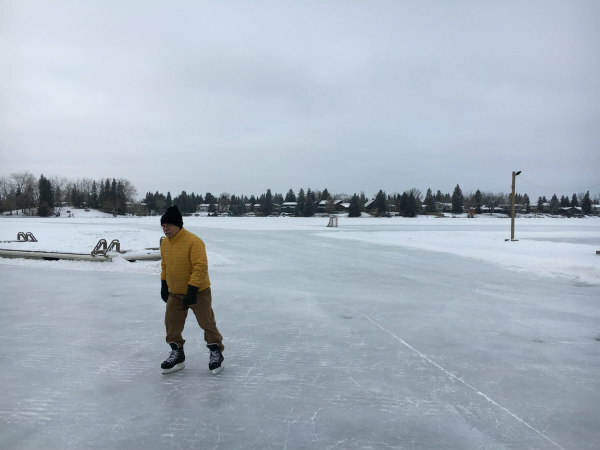 We joined the throngs of people to circle the lake but the real fun began after we crossed the barriers to skate the river for a few miles. 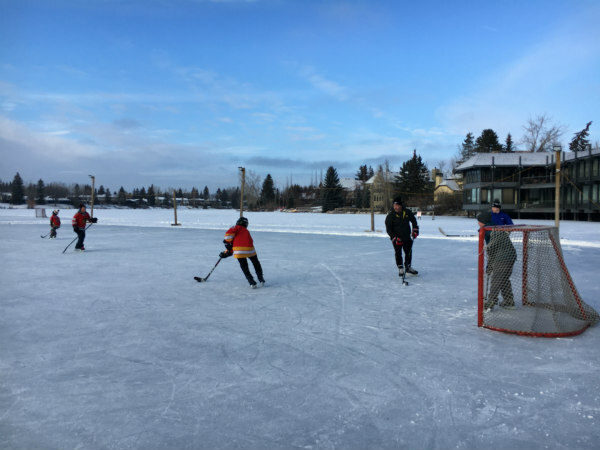 Canadian fun at its best! 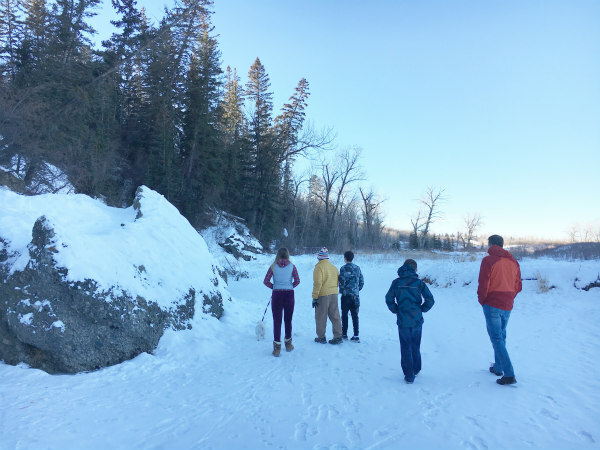 And another family favorite: Fish Creek Provincial Park. 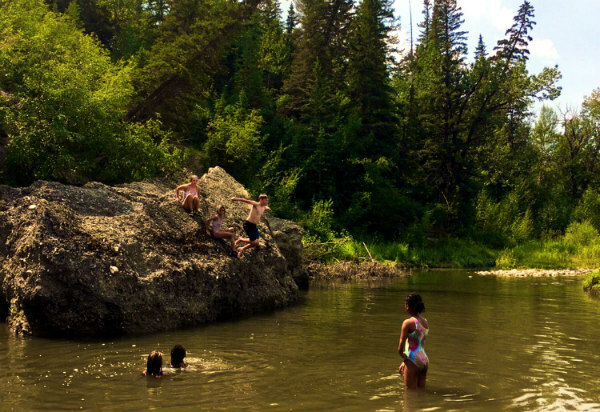 In the summer, it’s the mud pits and swimming. 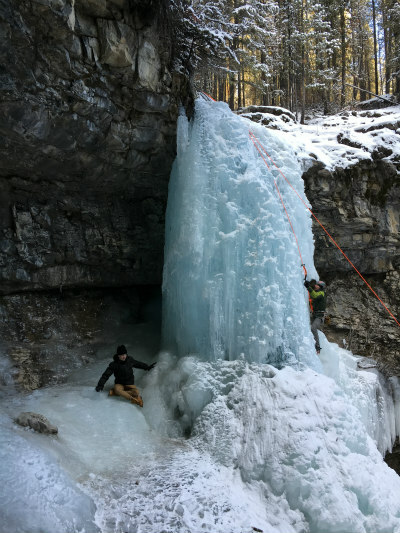 In the winter: Cautious Bode and Dallas (the dog) only had minor heart attacks about walking on the cracking ice. Also, what a difference a few years makes! 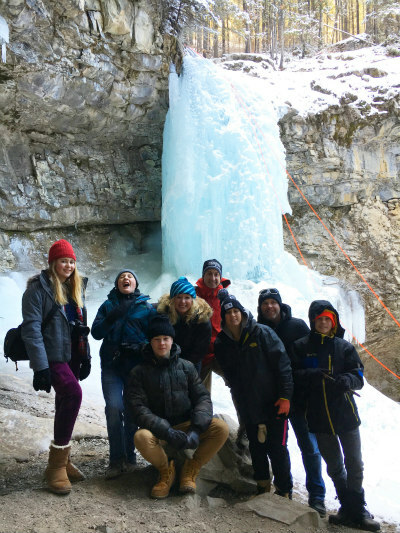 5) Troll Falls Insider tip #1: Skip Banff and recreate next door in Kananaskis Country—same gorgeous Rocky Mountains without the crowds and cost. Insider tip #2: When hiking steep, icy sections, link arms in a “love chain.” When someone starts to wipe out (like your brother) ditch him, even if it prompts his rebuke, “WHAT HAPPENED TO THE LOVE CHAIN?” Insider tip #3: When you say, “I feel like I’m the only sane one in the family,” make sure your mom is not editing the group picture at that exact moment where you look certifiably insane with your mouth wide open. 4. 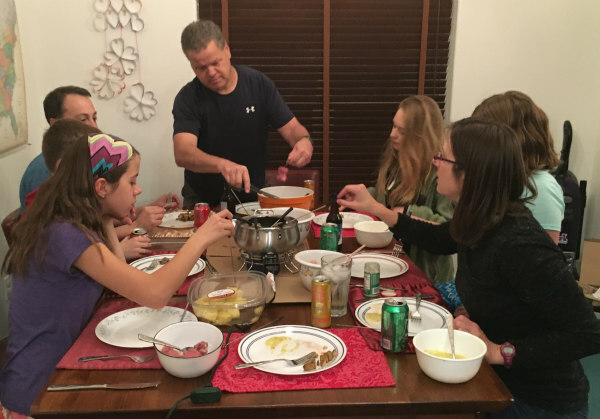 New Year’s Eve was replete with family, my bestie, Stacey, chocolate, cheese and meat fondue (which is to be repeated for Valentine’s Day), not be forgotten was marathon Pictionary when the team with the worst artists (Bode and me) somehow won. Christmas is, after all, a time for miracles. 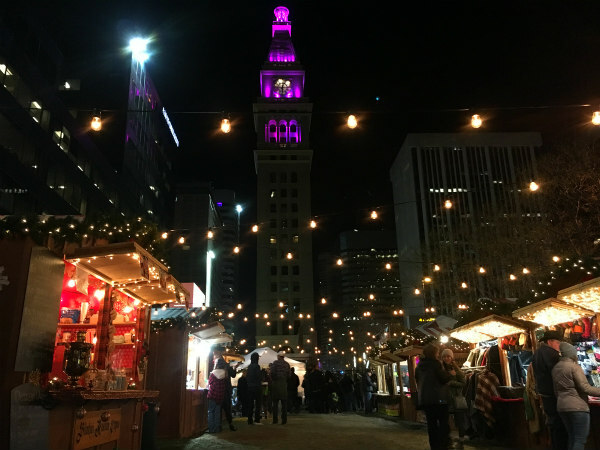 Thanksgiving in Colorado: who could turn down an offer to spend a long weekend in one of our favorite places? First stop: Denver. 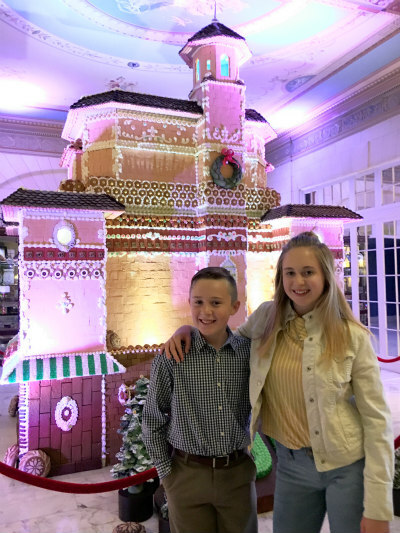 We crammed a lifetime’s worth of memories into 12 hours that included a drive-by of our old hood, Marcella’s crispy potato pizza, the magical Christkindl Market, Tattered Cover, downtown holiday lights and a stay at the modern-chic Crawford Hotel above Union Station. 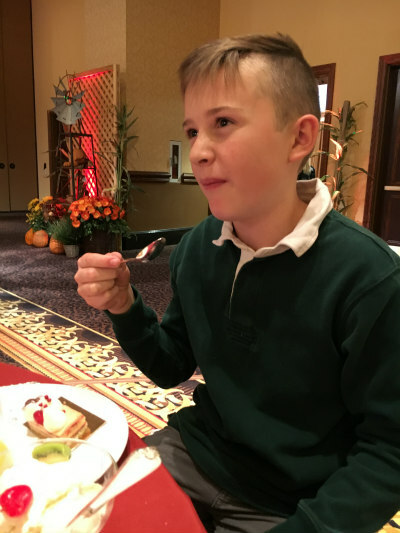 From there, it was onto the biggest, baddest Thanksgiving feast we have ever seen at The Broadmoor. 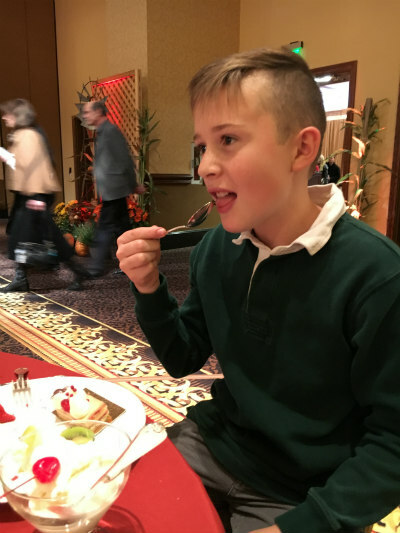 The buffet was, in Bode’s words, “exquisite” with a sophisticated twist on all our traditional favorites…plus some new culinary experiences. Bode overindulged in everything else to the point where he looked like he was in pain. 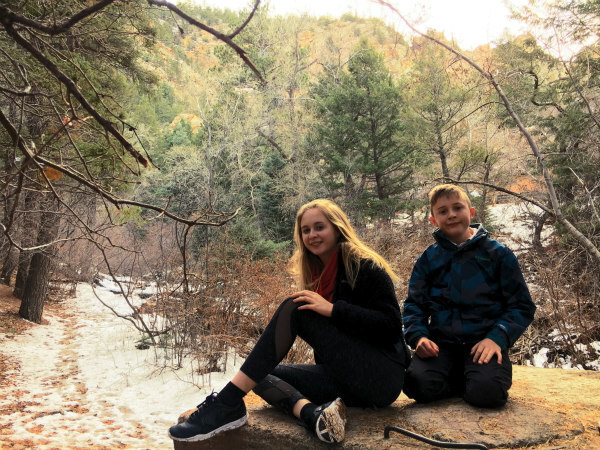 Our Denver Thanksgiving tradition was to hike Turkey Trot before dinner but we switched things up to hike in between feasts, which proved challenging when you’re in a food coma. 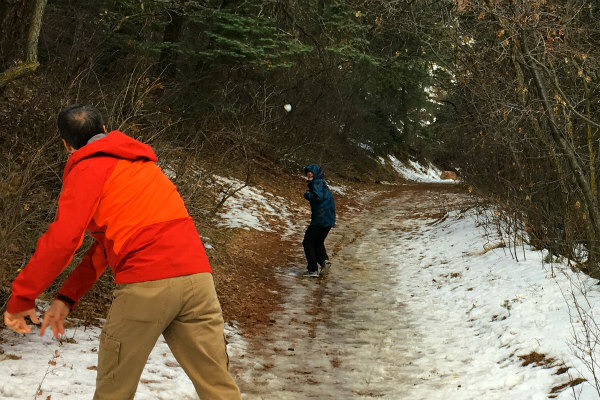 Fortunately, a snowball fight and the threat “you don’t want the old lady who just had knee surgery to beat you, right?” proved highly motivated. 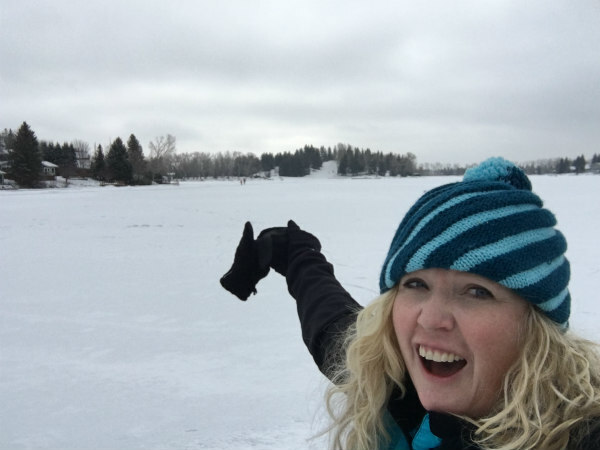 On Friday, I joined in the fun of The Broadmoor’s Turkey Trot 5K. I was first place of the losers (walkers). The Family: Slept in and ordered room service. Final score: It’s a draw. We also did our first photoshoot in years with one of our favorite people: Photographer Mic. 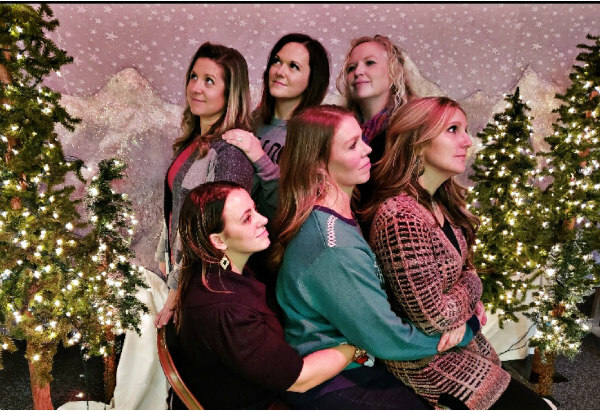 The pictures turned out fabulous! 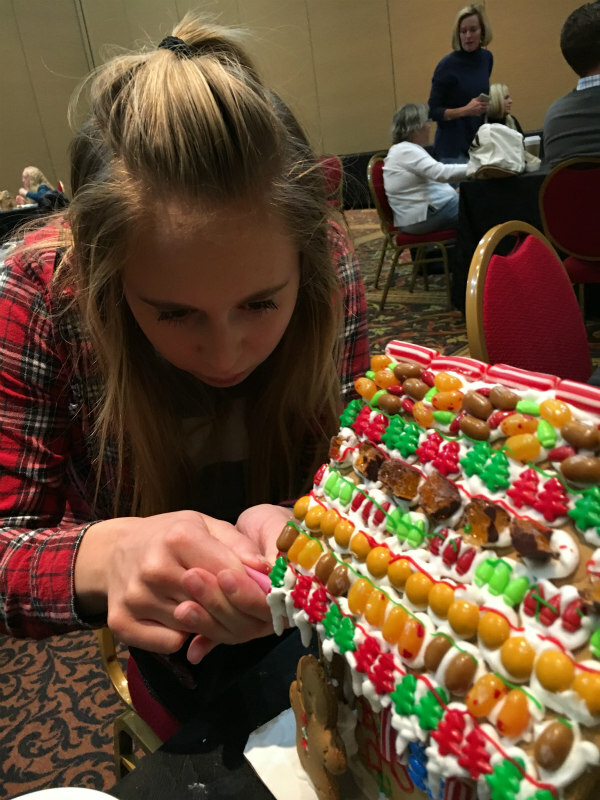 Fortunately, the rest of the weekend WAS sheer happiness with swimming, gingerbread-house making and posing, and Jenga, laser tag, checkers and pool playing. 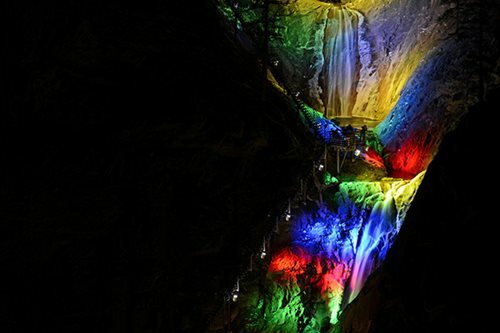 One night, we took the shuttle to Seven Falls Winter Lights. We ate at Restaurant 1858 at the base and since it was bitterly cold, we opted not to climb the massive staircase and instead took the archaic elevator which offered a bird’s eye view of the falls. It was cold (did I already mention it?) and the elevator was old (mentioned that, too). As we patiently waited for the elevator, a crowd of people spilled out and the doors promptly started to close. An elderly woman lunged forward, sacrificing herself as someone yelled, “NOT GRANDMA!” But I’m here to tell you those doors reopened and Grandma saved the day, just like every day. 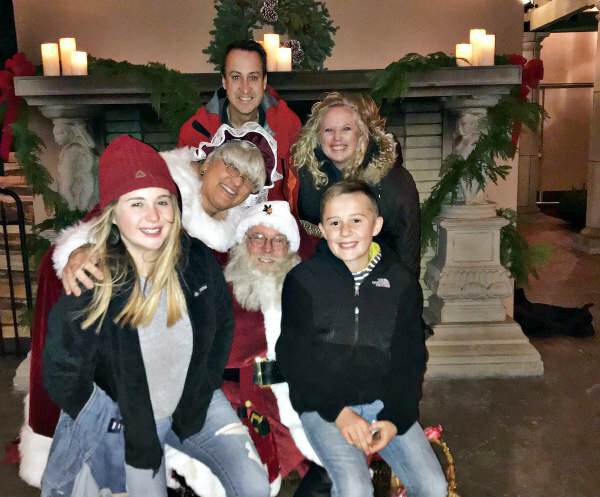 When we first attended The Broadmoor’s White Lights Ceremony six years ago, Christmas magic was at its peak…and Hadley bolted off to follow the merry band of elves when Santa made his appearance. Fast-forward to present day and the teens were, welp, teens. A blistering wind and cold picked up right before the ceremony. Bode braved it outside but Hadley bolted indoors. 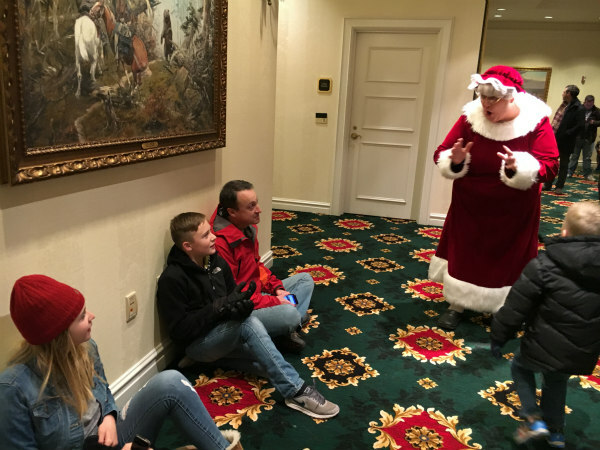 After the tree lighting, they reluctantly followed the droves of kids to what we thought was storytime but when we found out they were only visiting Santa, they wanted nothing to do with it. 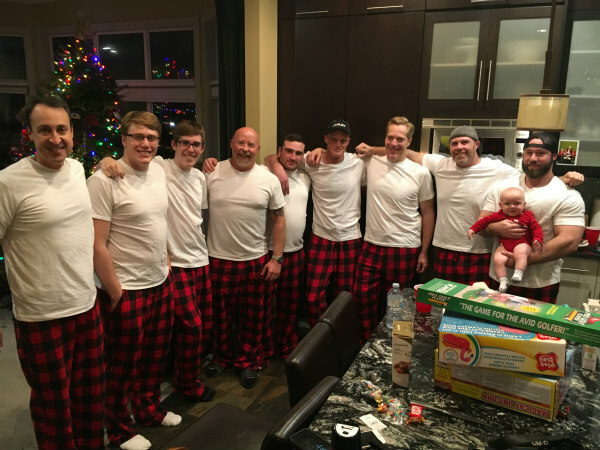 But then it was almost like the Christmas elves got together and hatched a plan to remind them what the holiday spirit was all about. Mrs. Claus, unprompted, walked over to where those teens were sitting and gave them their own private storytime full of delight, humor and wonder, making believers out of all of us. 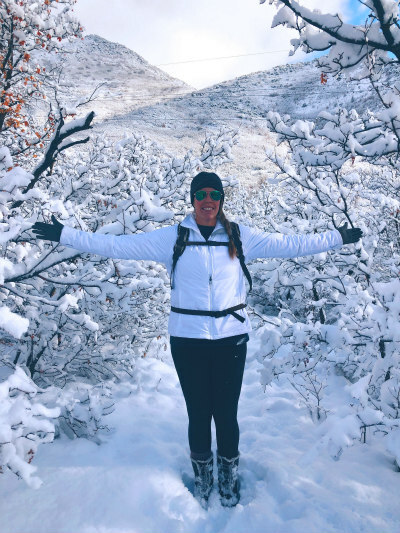 I worked from home yesterday after a controlled avalanche closed Provo Canyon (my commute) and deposited 30 feet of snow across four lanes of traffic. But you won’t hear any complaints from me after last year’s dismal snow. Bring it on!!! 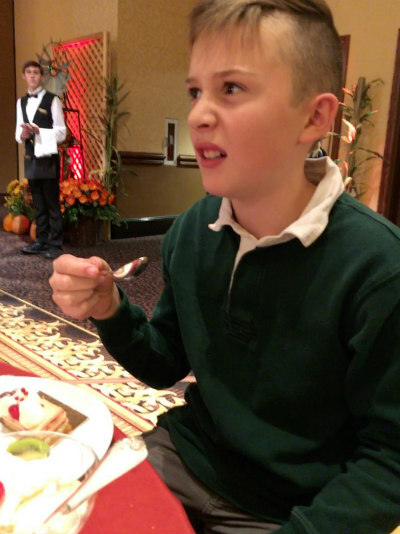 I’m woefully behind on updates from Thanksgiving (Colorado and The Broadmoor) and Christmas (Canada). 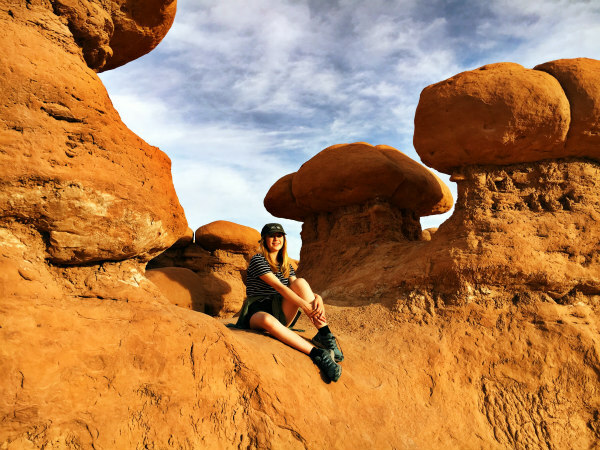 I set the goal to blog more because this is really my journal but between working (and my daily 1.5-hour commute), Mile High Mamas, freelance projects and family, there isn’t a lot of spare time. So, a few quick updates that I will hopefully expand upon another time. 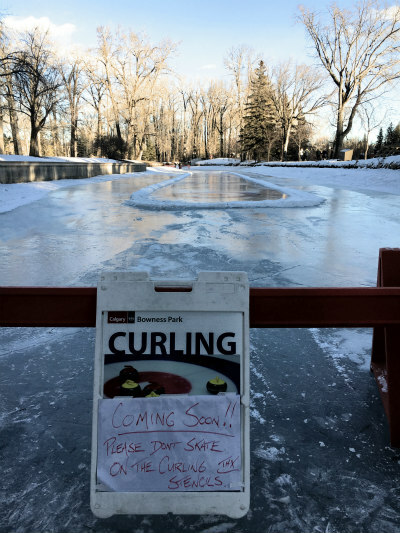 My contact at The Broadmoor just retired so I HAD to get one more story assignment for the magazine. Thankfully, she bit and assigned me to cover their over-the-top Thanksgiving buffet and White Lights Ceremony. 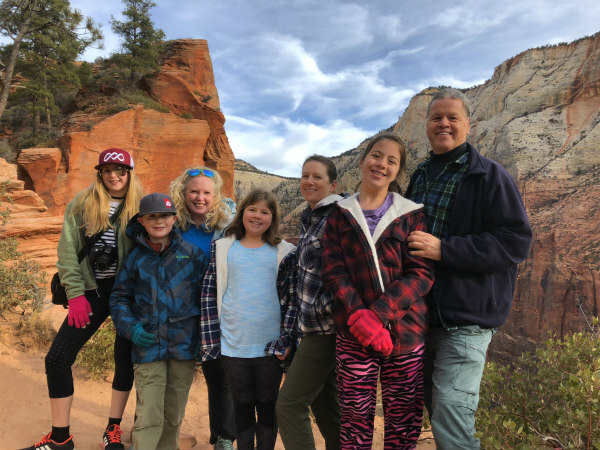 We had the time of our lives (as always) and the good news is I get at least one more return trip as “payment” for the article, so we’ll return in May for Hadley’s birthday. I probably spent 30 hours interviewing, researching and writing it but what I get in return (two glorious stays) is so worth it. 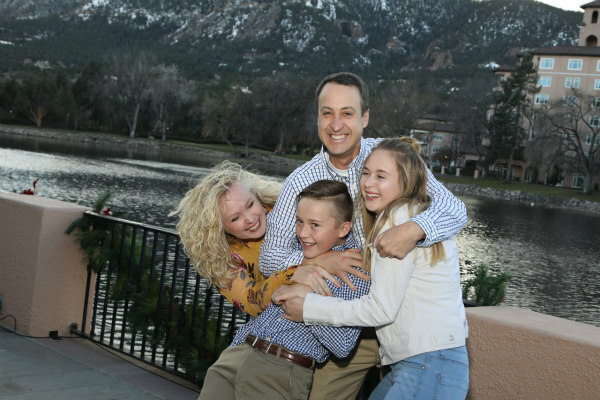 I love that The Broadmoor will always be my family’s happy place because it is truly special. 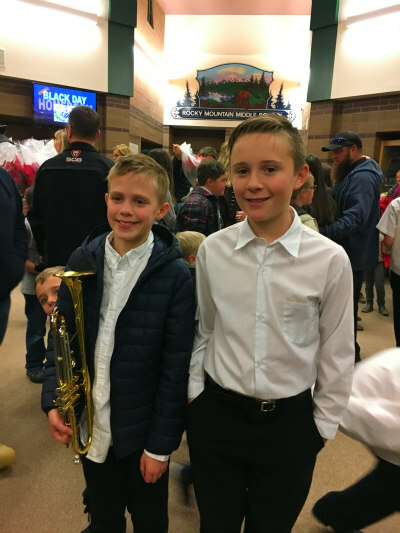 December was busy with Bode’s sax concert and Hadley’s art show. 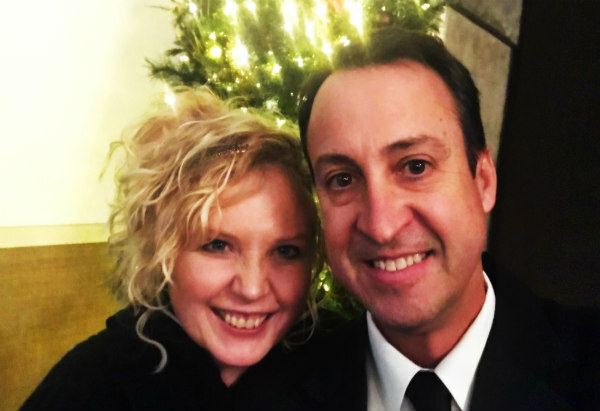 We invited some friends over for a cookie exchange prior to going to Midway’s Creche exhibit and Jamie and I had a fun time getting dressed up for the Heber Chamber’s formal Christmas dinner. 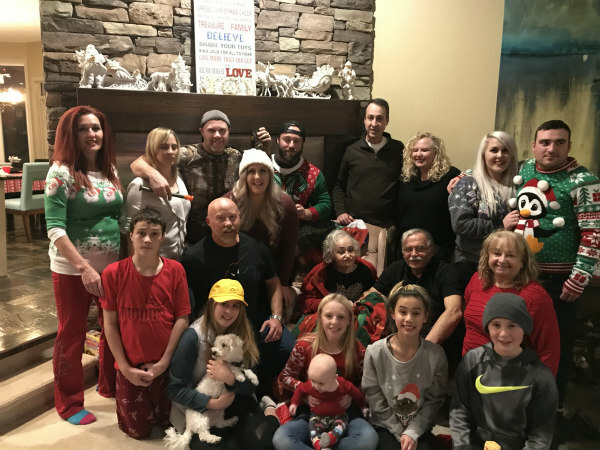 We went caroling with friends and were invited by the publisher of Heber Valley Life Magazine; it was so fun to network and meet new people. I skipped out on my big baking extravaganza since we were leaving for the holidays but made approximately one gazillion gingerbread cookies. 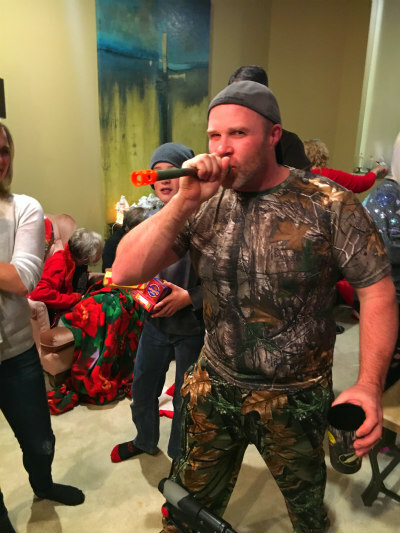 Our annual ward Christmas party is always fun. 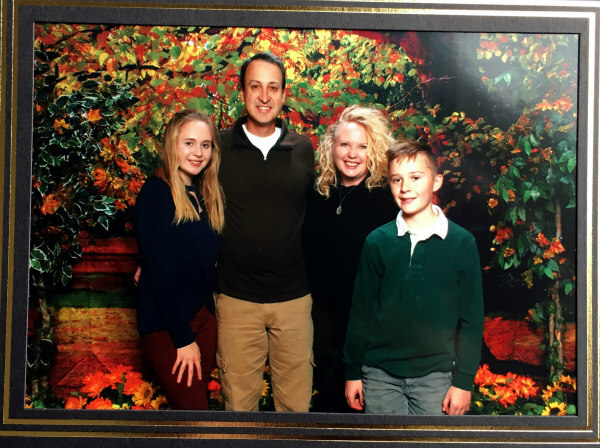 This year, they had a photo booth where Hadley volunteered by taking photographs. The best photos of the night were undoubtedly our photos with Bonnie Jean, Paige, Lynn, Jana and Jen. 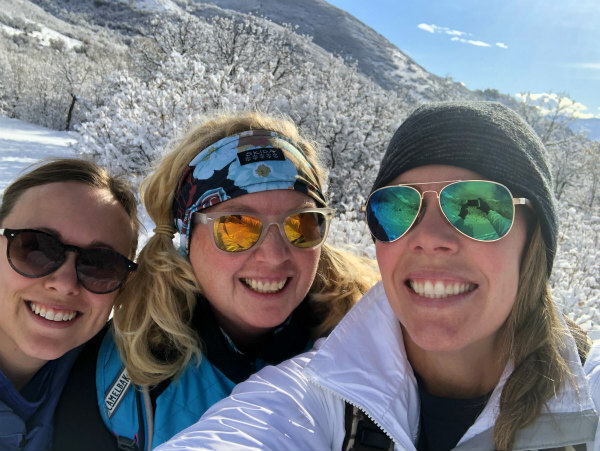 We had a couple of great snowfalls and my first snowshoe adventure with friends Jana and Sarah was pretty epic. So so so beautiful! Have I mentioned I love snow? Bode and I are cross-country skiing twice a week at Soldier Hollow after school. We were in the intermediate-level group until he got bumped up to the experts and I’m very happy to be left behind. 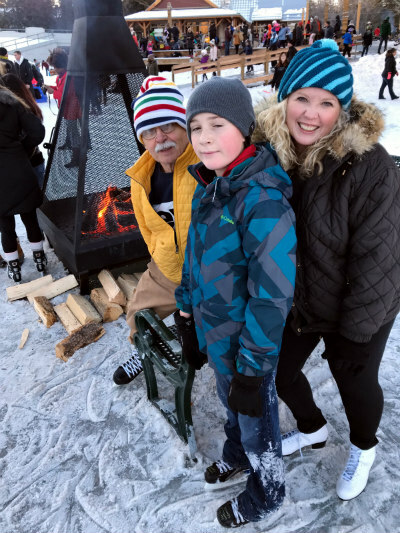 He’s become a great skier, both downhill and Nordic. It seems like since we moved here two years ago, weekends and evenings have been so full of drudgery and yardwork. But guess what: when your yard is buried under a foot of snow, Jamie can’t make you haul 61 tons of rocks so we’ve been hitting the slopes every chance we get. Hadley is really struggling with PTSD after that snowboarder slammed into her last year. I totally get it. I was hit from behind two years ago by a skier and I’m still on edge whenever I hear anyone coming up behind me which is a nice way of saying I yell at a lot of reckless people. Jamie: Only brought one ski boot for reasons that aren’t entirely my fault but I will take the blame because it’s his birthday weekend and he had to drive home to get it. I was stuck in the season ticket office about the same amount of time so we’ll call it a draw. I had resigned we wouldn’t be able to go home but was thrilled when a friend informed me she had found $300 tickets to Calgary, which is unheard of. 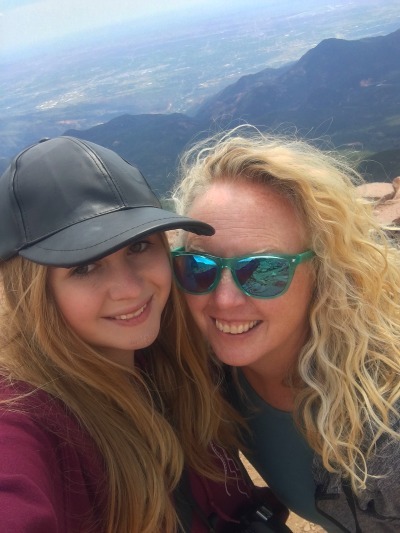 Our trip was full of the good, bad, ugly, hard, glorious and dramatic all wrapped into one and I’m so glad we were able to go to spend time with my mom. 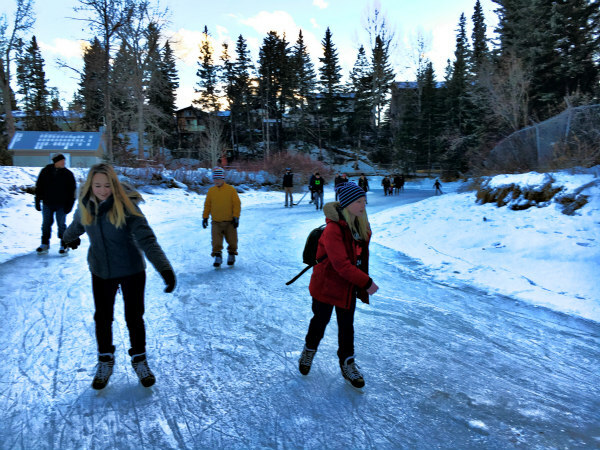 The weather has been pretty mild in Canada so I was unsure if we’d be able to skate and do some of my favorite winter activities but thankfully, the lakes and rivers opened for skating right before our arrival so we had a great time on Lake Bonavista and Bowness Park, as well as spending a day in Banff. 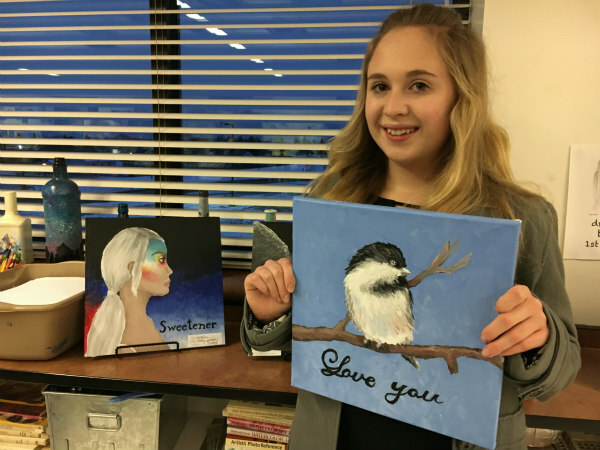 2) Hadley winning the middle school art show. 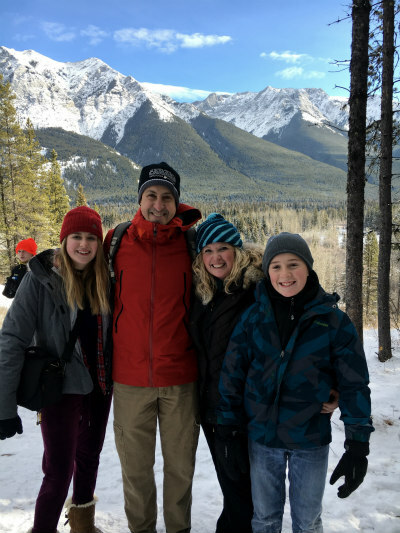 9) Waterton Lakes (my favorite place on earth) with my kids and Dad. 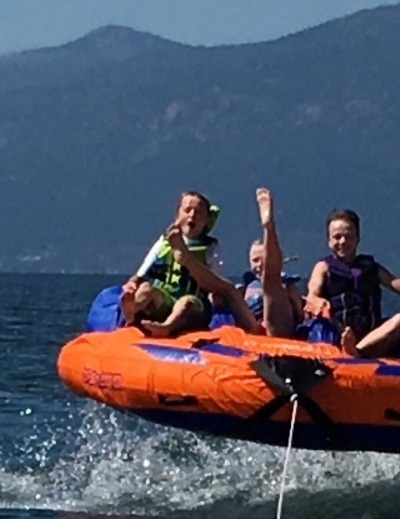 The kids and I spent a glorious two weeks in Canada. 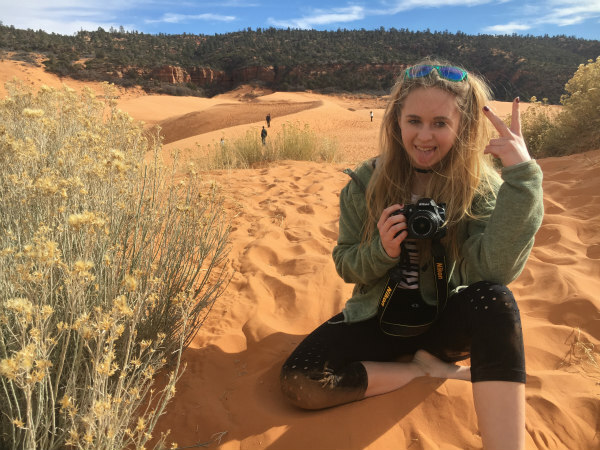 The whole thing was a whirlwind: Hadley was on a 3-day Pioneer Trek just prior and had to return two weeks later for BYU volleyball camp. So, we packed up and headed to British Columbia, breaking up the 18-hour drive with an overnight stay at my sister-in-law Jane’s wonderful parents in Eastern Washington. My brother and his wife have been renting the Mana Manor in Vernon for 15 consecutive years and the rest of us have been coming for five years. It’s not a fancy cabin and is in dire need of some overhauls but it’s convenient and is divided into four different two-bedroom units. I had asked if we could only do a 5-night rental instead of 7 and assumed it was a done deal when my brother reached out to the owner but through some miscommunication, we never heard back. I found out the week prior that the kids and I didn’t have a place to stay. Fortunately, I ended up finding a great rate at a nearby Best Western. So, while the kids bunked with their cousins at the cabin, I made the 15-minute drive to my air-conditioned and clean hotel room to decompress each night. I’m a convert! It was the smallest group yet. Poor Jamie was too overwhelmed with work and yardwork so couldn’t come; Ashton only came for a few days because she just had a beautiful baby boy, Raiden, and my niece Emily and her boyfriend just returned from Ireland so couldn’t take off work. My mom and dad have been unable to attend the last couple of years due to her health. They were all missed but the smaller group didn’t deter us from having a grand ‘ol time; Pat and his wife were generous hosts as always. 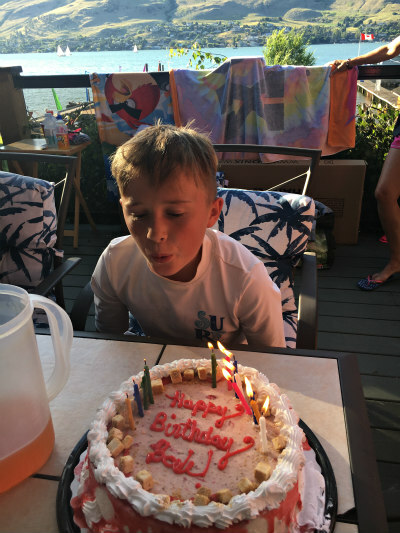 We celebrated Bode’s 12th birthday with Timbits, a successful surf, smoked pork sandwiches and a strawberry cheesecake Blizzard ice cream cake from Dairy Queen. Presents included his first new bike, some golf clubs and books. How we love this sweet boy! 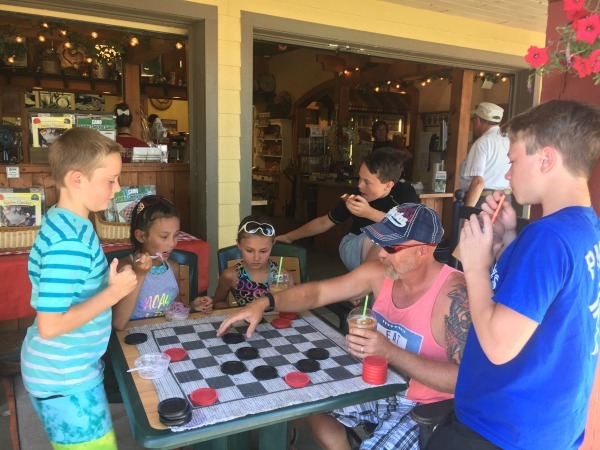 We had our traditional visit to Davison Orchards for killer peach, cherry and apple pies, fresh cider slushies, cut throat checkers and farm animals. 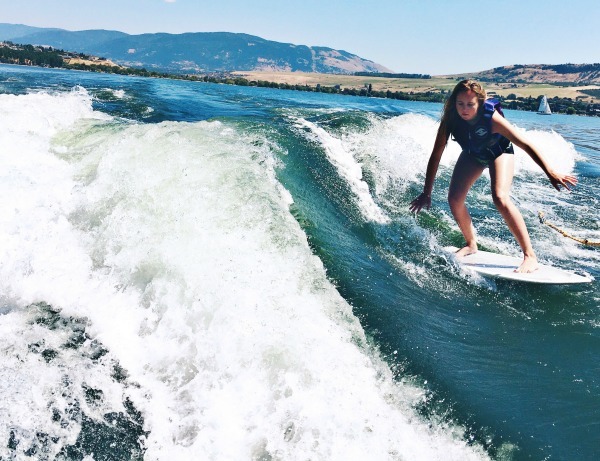 We all vastly improved in wakesurfing, Hadley in particular really clicked out there, dropped the rope and was surfing! I did my best ever, which still isn’t super great but the good news is I’m not regressing. Bode is slowly moving forward as well! 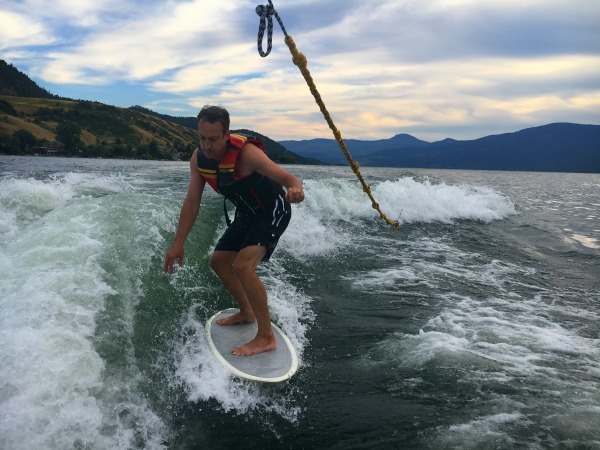 We marveled at my brother’s new toy, a wakefoil that had him surfing two feet above the water. 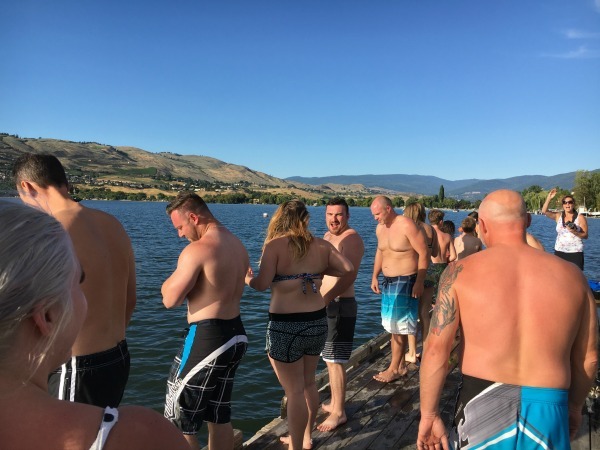 We had our annual dive-off. I had great hopes that family friend Todd would dethrone Pat from the title but he came up way short. I blame Pat for stuffing Todd with food just prior (an evil strategy). 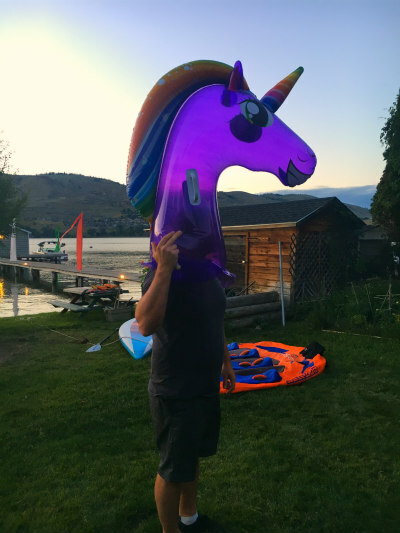 The unicorn. Jade jumped on it in the lake. It popped. All that remained was its head. 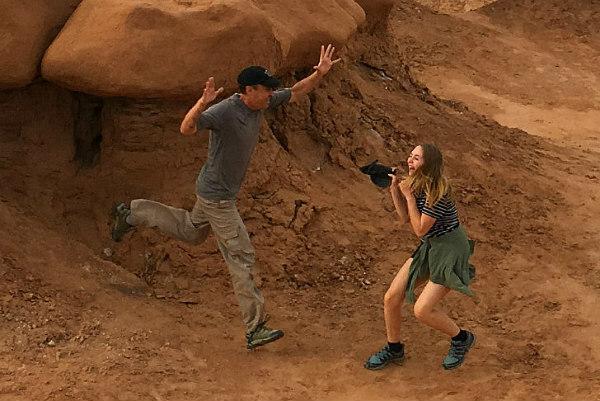 Teenagers can be fun but not always. 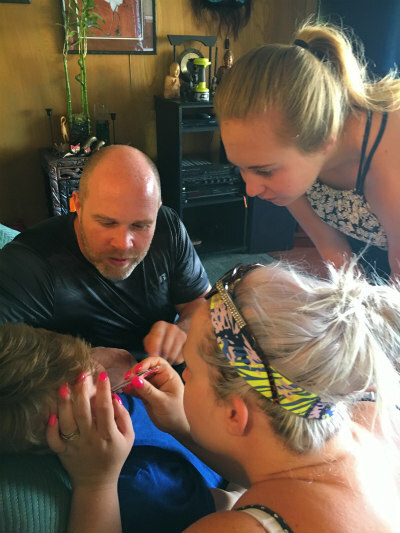 One of their redeeming qualities is they have zits the entire family loves popping. 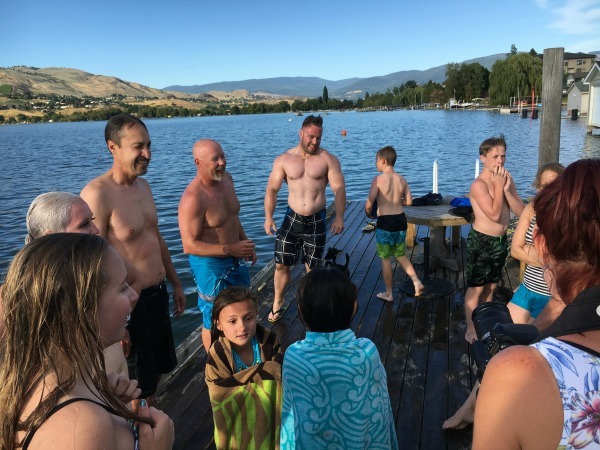 Pat brought his stand-up paddleboard and we all had a blast paddling around the perimeter of the lake…except for when Hadley took it out, got caught in a scary wind storm and had to be rescued by a cute guy in a boat wearing a Superman shirt. We brought our volleyball net so downtime was spent playing volleyball, some crazy-competitive badminton tournament and boulle. 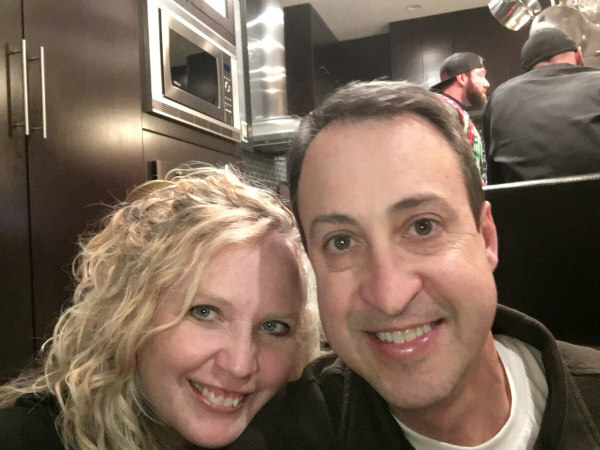 Friends Tom and Kim have been through a lot this past year, including losing their beloved lakeside rental home to a terrible storm. But they’re always really generous and a part of our family when we come to visit. 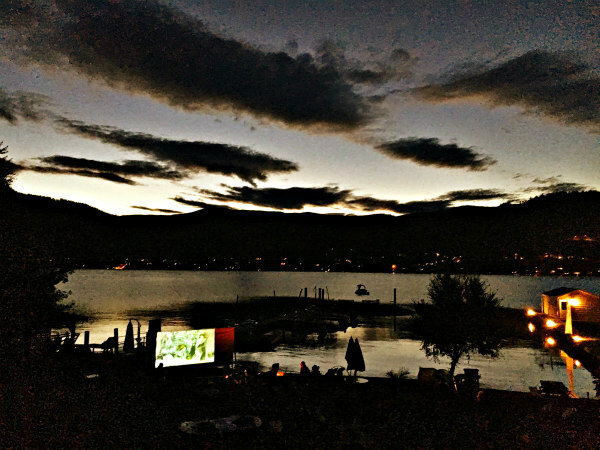 Todd brought his lakeside movie night to us and it’a favorite tradition! And the perfect way to end a fantastic week at the lakehouse. 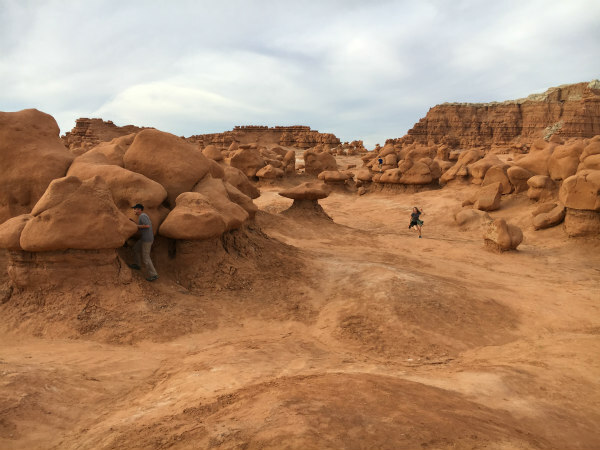 Though we are knee-deep in our 43 tons of rock with the goal to get the backyard grass seeded by early June, we booked an overnight camping trip at Goblin Valley State Park several months ago and despite what seemed like imperfect timing, it actually could not have been more perfect. We’re limping across the eighth grade finish line (just two weeks to go!) 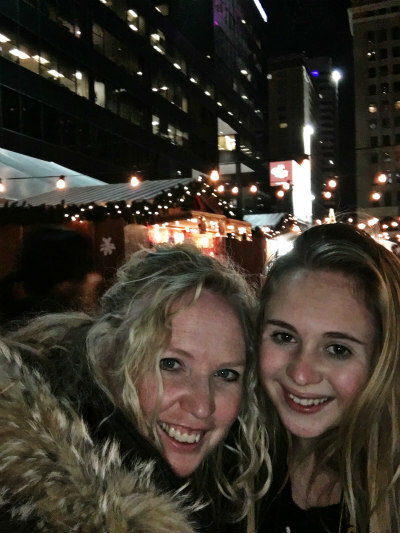 We had just had one of our roughest weeks with Hadley (parents who whine about how difficult parenting their honor-roll teen who can be moody and disrespectful make me scoff; we’re deep in the trenches here with real struggles). 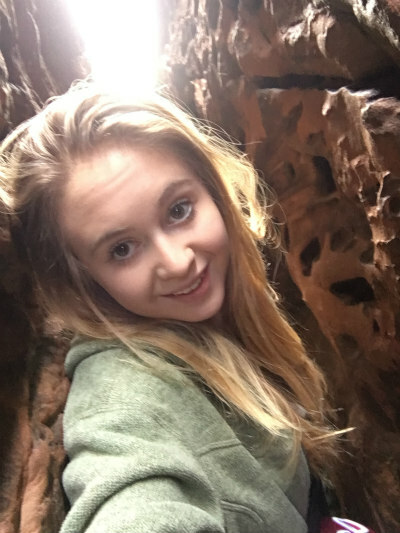 But if there’s anything that brings me hope is pulling her out of her environment and into where she thrives–the outdoors! We were only able to book a one-night stay but that turned out to the be perfect amount. We woke up early on Saturday, drove a few hours south, had a full day of adventure, camped out, and made it back in time for 1 p.m. church. 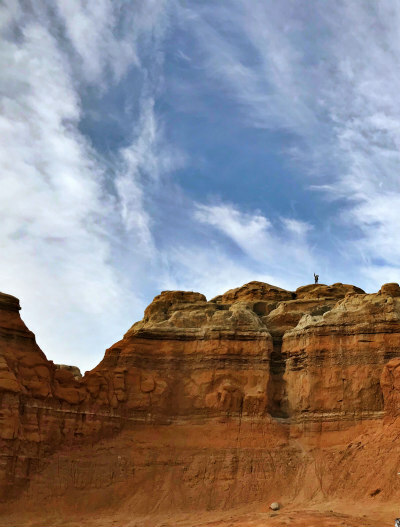 San Rafael Swell Whenever I spend time in Southern Utah, I’m bombarded with memories of my many years as a Utah-based travel writer. 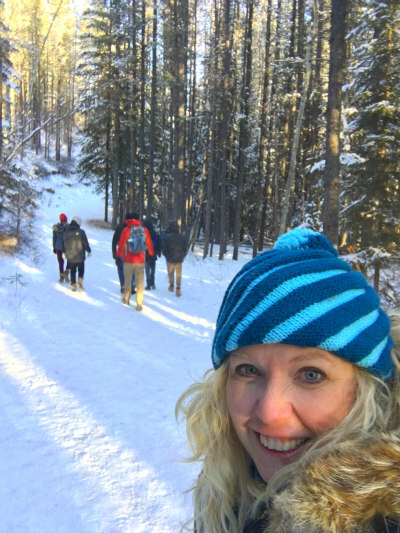 What wonderful adventures I had backpacking and camping with Kristy, John, Dave, Ray, Telford, Karleen, Joseph and Jed. My photojournalist friend John traveled with me more than anyone. We had many moments together but none more memorable than getting stuck in Ding and Dang canyon; another story for another day. The desert drive is desolate (despite Hadley’s “gazelle” sighting) until the San Rafael Reef appears in the horizon. 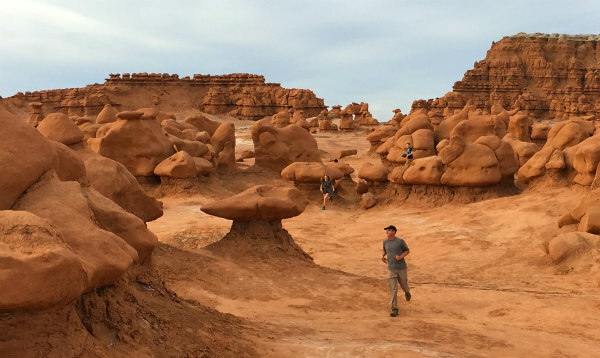 Early settlers used the word “reef” as a comparison to oceanic reefs and the difficulties of traversing through the 2,000-square miles of arches, deep canyons and rock towers. 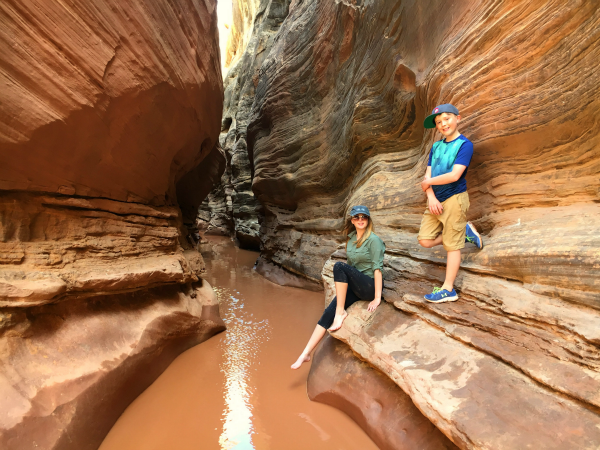 Our family headed to Little Wild Horse Canyon, a gorgeous slot canyon in San Rafael Swell that is part of a larger loop back through Bell Canyon. 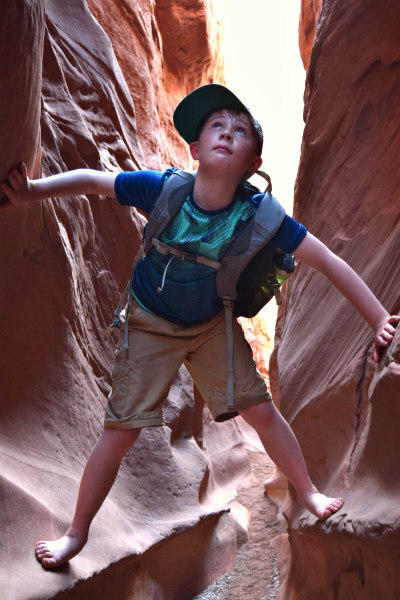 Little Wild Horse is the perfect introductory slot canyon that allowed us a few hours of adventure. Scaling the walls. Forging through water. Climbing boulders. 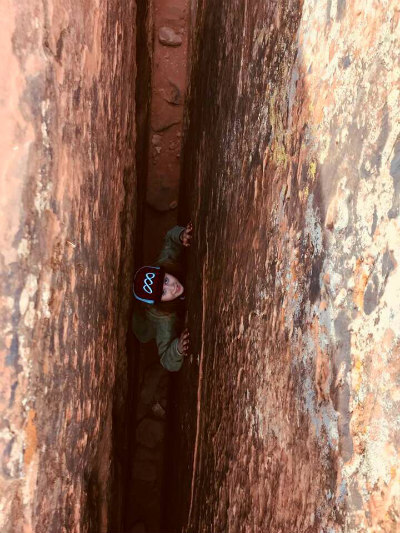 Snaking through tight spaces. The weather was perfect and our souls were filled with exuberance to be exploring something so epic. 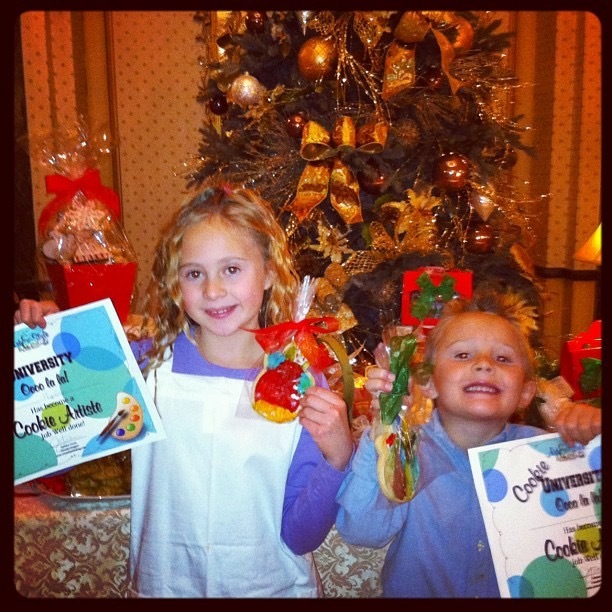 I loved seeing my tween and tween become like little kids again! 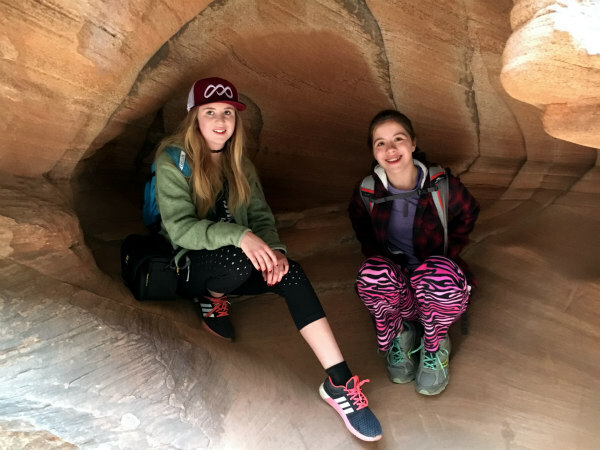 We had planned to also explore nearby Crack Canyon but we emerged from Little Wild Horse around 3:30 p.m. so figured we would go check into our campsite and chill a while. 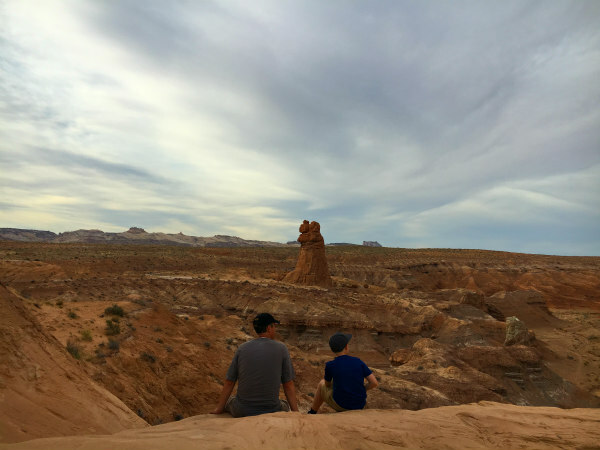 The campground’s backdrop was massive gothic cathedrals, which Bode, Hadley and Jamie delighted in exploring while I rested my knee. We started a campfire (Jamie and his lighter fluid scare me), grilled up burgers, roasted potatoes and had delicious watermelon. 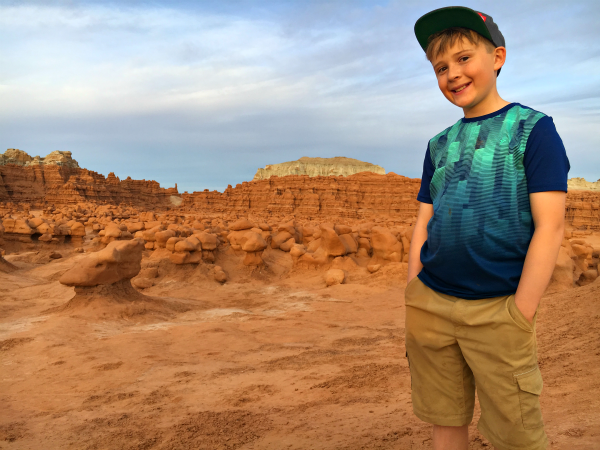 Before dusk, we drove to the main portion of Goblin Valley State Park. 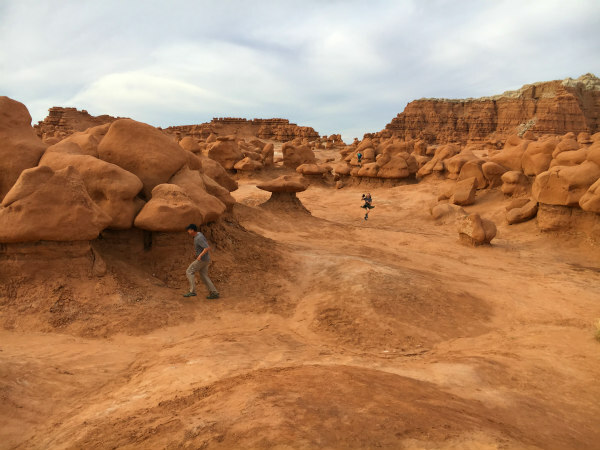 The crowds of the day had petered out so we were practically all alone in the maze of twisted, stunted “goblin” hoodoos. 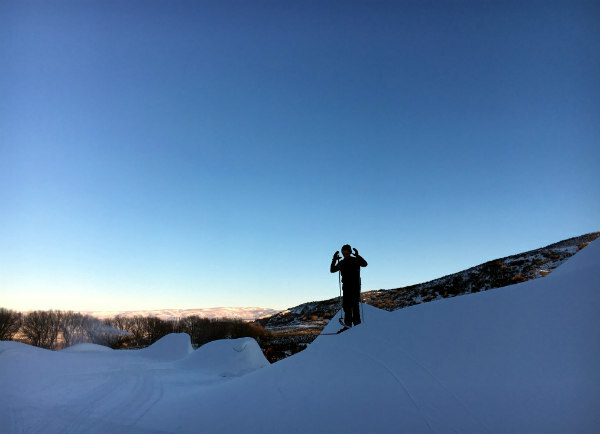 The park is divided into “First, Second and Third Valleys” and the best way to explore is to have no plan at all. 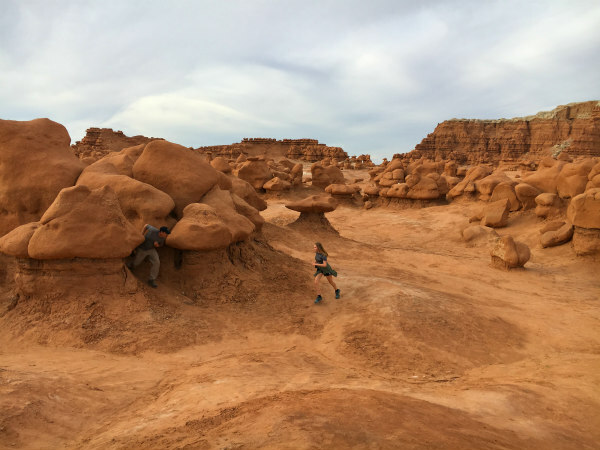 Jamie won Dad of the year by playing hide-and-seek with the kids in the ultimate outdoor playground. I conjured up their imaginations as we saw shapes and forms in every hoodoo: goblins, Jaba, mushrooms, Fat Kitty, clouds, spaceships and whales. I was initially sad I didn’t take a video of Jamie scaring Hadley in tag but this progression is downright hilarious: We ventured over to the Third Valley and gazed in awe at the cathedral buttresses’ commanding presence. 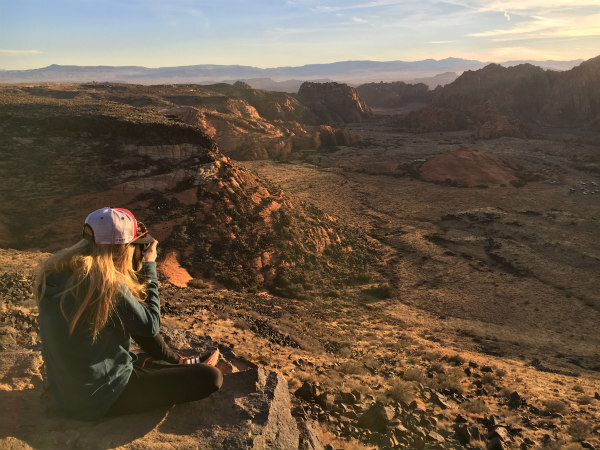 As we hiked back near the Observation Point, we perched on an overlook as the ebbing sun set the valley on fire. Jamie answered Bode’s questions about great places and events in history. 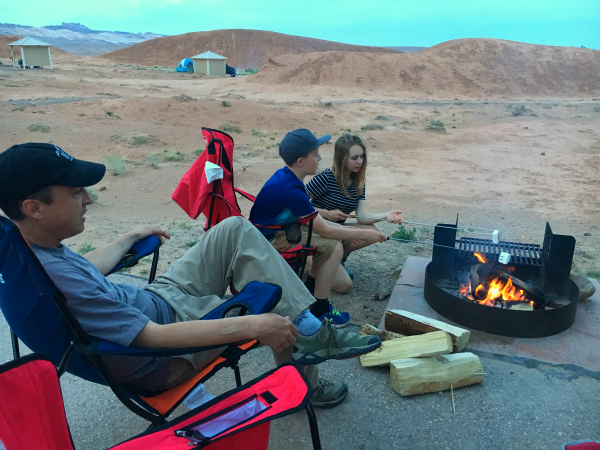 Back at the campsite, we roasted s’mores, read from the Book of Abraham about the stars, how we have always existed as “intelligences” before we were spirits and the eternal nature of our souls. Then, I went on to sleep horribly all night. 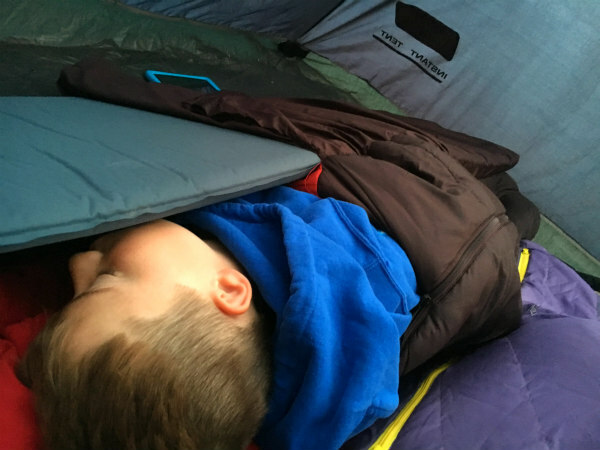 I love everything about camping except for restrictive sleeping bags and pads (despite Jamie’s best efforts to buy the latest and greatest) and noisy neighbors. When the sun rose the next morning, I noticed Bode cuddled up near me with HIS SLEEPING PAD ON TOP OF HIM. 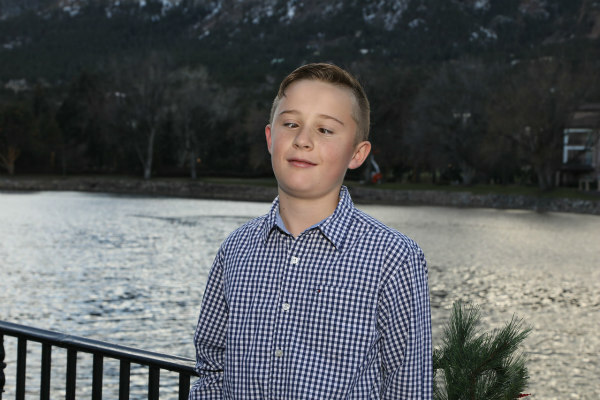 We all need to be like Bode. 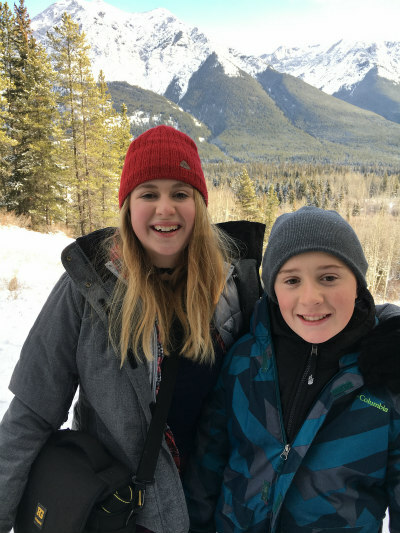 We packed up early while Bode and Hadley set out on one last adventure. They had fallen just short of summitting the buttress behind our camp. 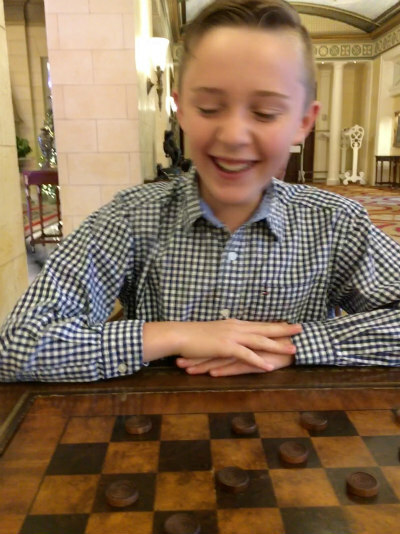 Cautious Bode gave up after a while but Hadley emerged triumphant! Which is how we all felt after a much-needed weekend of adventure, laughter and healing. 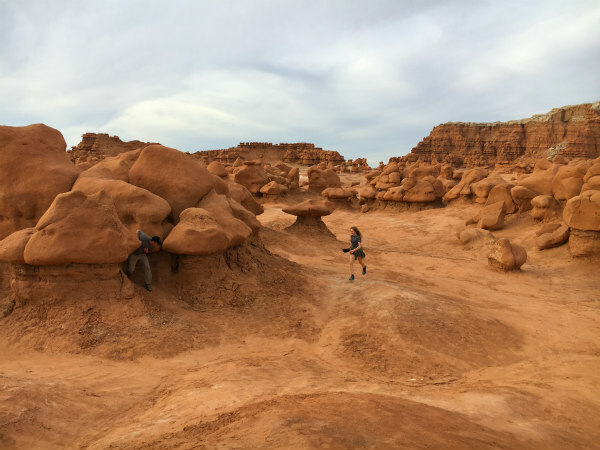 We have lived in Utah over a year and have not explored Southern Utah at all. 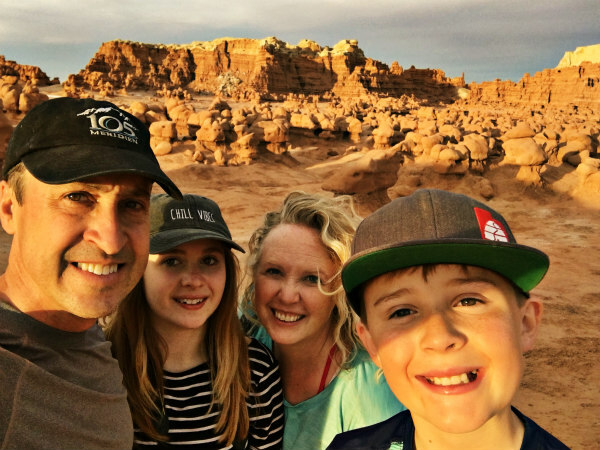 We spent last New Year’s Eve in our beloved Colorado so this year, I was NOT going to be stuck here without plans (we would later get invited to two parties) but I’m glad spent our long weekend with good friends, Dave and Rebecca, in St. George who make us look like homebodies. 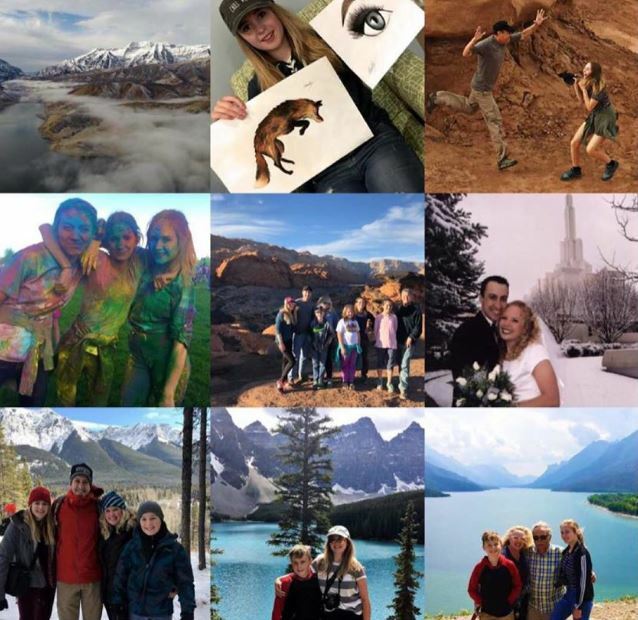 They adventure almost daily, just returned from a trip to Kenya, are going to Hawaii next month and then to Australia and Fiji later this year. You’d think with those itineraries they would be extremely wealthy and while they do well, they’re also minimalists and have very few material possessions. It’s all about priorities, folks. 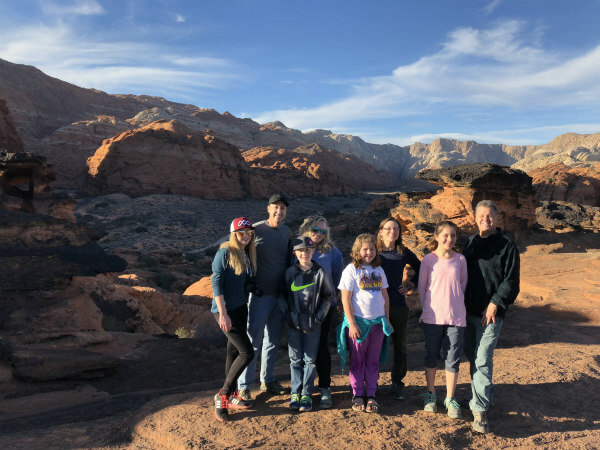 When we arrived, we hiked the Hidden Pinyon Trail in Snow Canyon State Park, a wonderland of ancient lava flows and red Navajo sandstone. 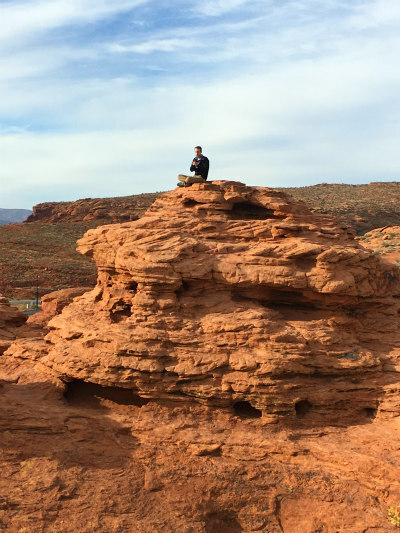 This 7,400-acre scenic park’s majestic views of lava-capped ridges was our perfect introduction to the desert. 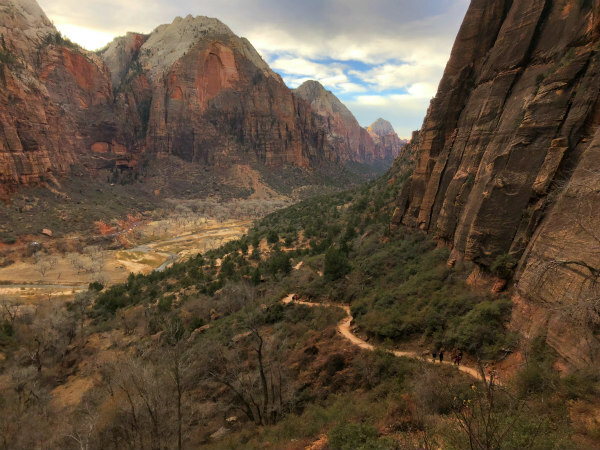 When I was a Utah-based travel writer many years ago, some of my favorite adventures were in Zion National Park. 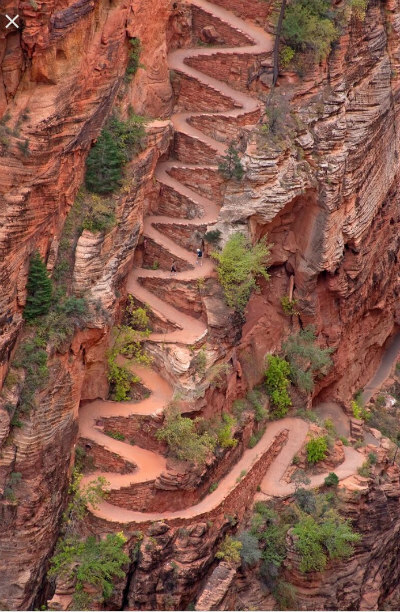 Angel’s Landing. Observation Point. 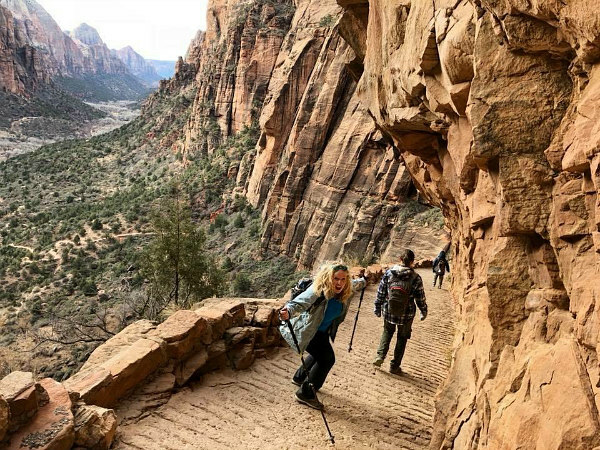 Backpacking the West Rim Trail. Truly, it’s like no place on earth and I was saddened to see just how overrun it has become. In the peak season, shuttle buses run to help with the congestion and lack of parking but on this busy holiday weekend in the off-season, there were no such options. Dave is the ultimate trip planner and insisted we had to wake up at 5 a.m. to get a parking spot. We whined and complained but he was correct–by 6:45 a.m, all the parking was full. 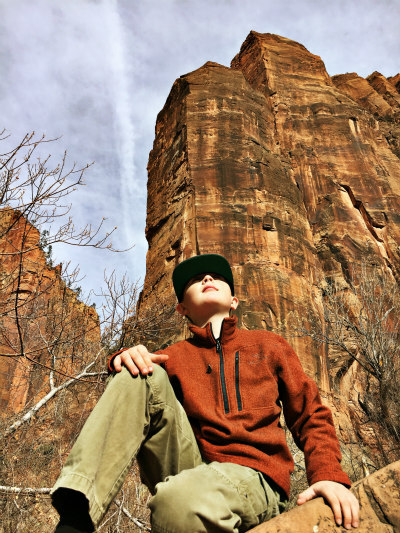 It was a COLD morning so we stayed snuggled up in their van until the sun warmed the red rock cliffs. Sadly, Jamie had a rheumatism attack all night long so stayed behind to sleep. 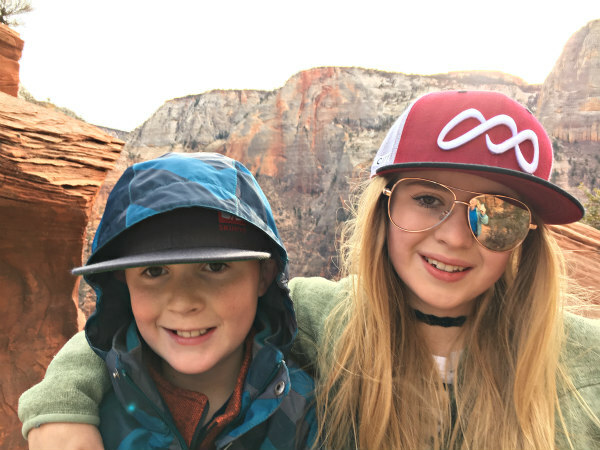 Angel’s Landing is the most iconic hike in the park (besides the Narrows) and my kids were both dying to do it…but Dave’s youngest daughter was wary of scrambling on the vertigo-inducing precipitous cliffs with only a chain to hold onto. 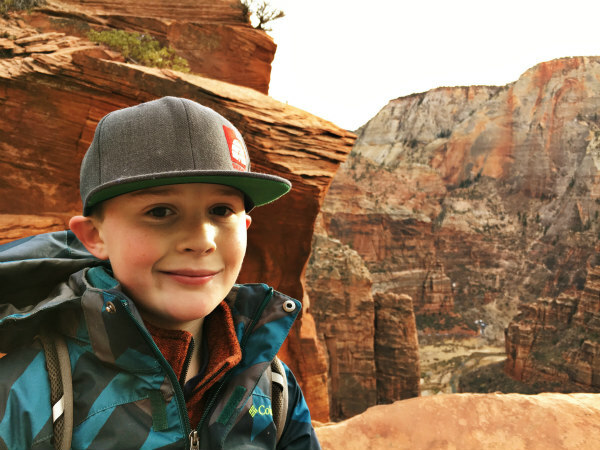 We instead opted to hike to Scouts Landing, which took us to the base of the Angel’s Landing and though I’m sad we couldn’t knock this one off the kids’ bucket list, we were just happy to be there. And I was particularly happy my knees withstood Walter’s Wiggles’ steep switchbacks and the descent. 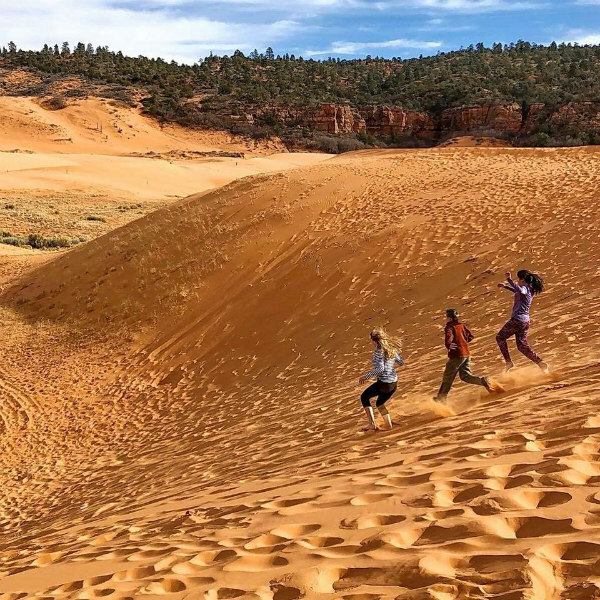 Following our hike, we took a lovely southeast detour to Coral Pink Sand Dunes State Park’s shifting sea of soft red sand. 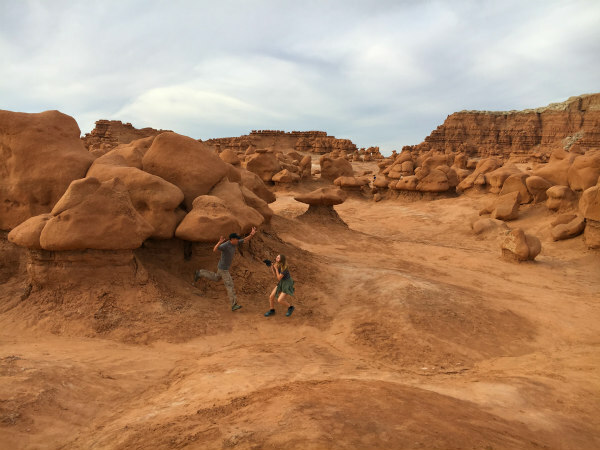 Formed from the same iron oxides and minerals that give us spectacular red rock country, the tired kids came to life–racing, jumping and rolling down the rippling arcs of rust-colored sand. 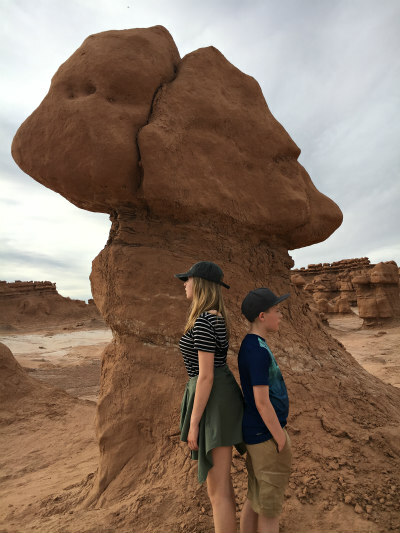 The LDS Church is true all the time but especially true in St. George. Because it was New Year’s Eve, we only had one hour of meetings as opposed to three + a speaker didn’t show up so we got out early. 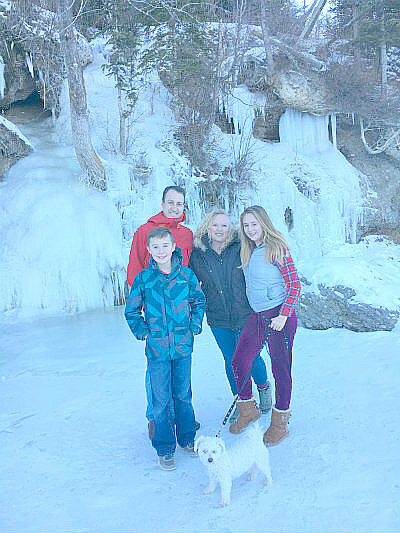 We took our family to tour Brigham Young’s Winter Home, followed by a hike. 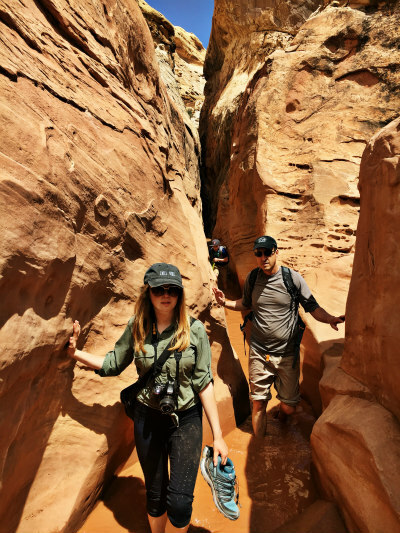 We were looking for something low-key because it was the Sabbath and stumbled upon the coolest area in St. George, the Red Cliffs Desert Preserve with slot canyons, an arch and the coolest sandstone formations that felt like we’d be dumped off on Mars. New Year’s Eve was just as memorable. 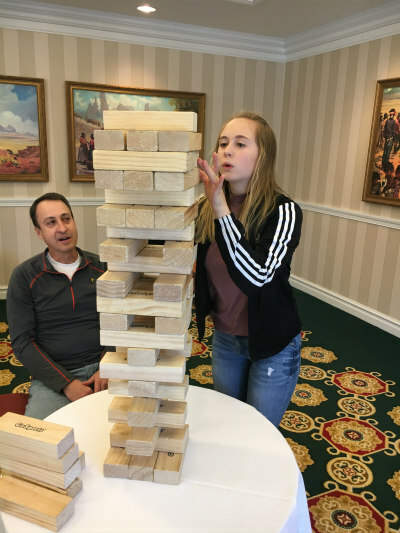 We had full-contact fondue and Rebecca had pulled together some fun Minute to Win It Games. I had gained the reputation with their daughters as “the fun one” so they fought to have me on their team, which they later regretted. You win some, you lose some. Or in my case, you lose them all. Because every New Year should begin with a death threat. Here’s a “killer” 2018. I’ve been busy wrapping up an article about our trip to Central California for fall break. 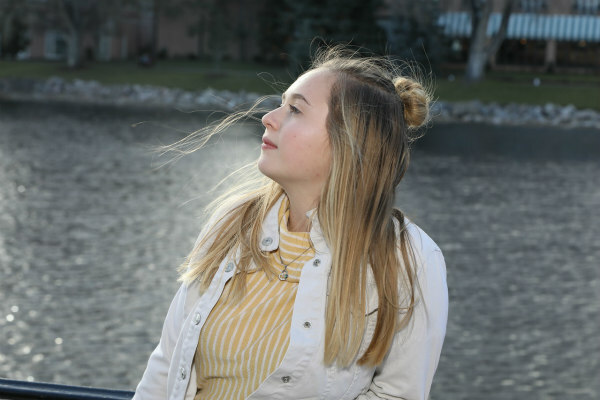 It truly was a breath of fresh air after what feels like a year of non-stop stress. Not-so airy? The long drive to get there. Las Vegas is my least favorite place on earth but the kids have never been there. It marked the halfway point so we gave into Hadley’s pleas and made a quick detour. As we were cruising along The Strip, we noticed the car was making funny noises. Now, some of you might remember the nightmare-that-was-last-summer, my Honda Pilot’s steady demise and the thousands of dollars in repairs we’re still paying off as it sits in our garage, undriveable. And if our Pilot is sitting on our garage waiting for us to pay off last summer’s bills while we scrape together enough money to get a newer one, that means it was Jamie’s car we were driving that was having problems. Oh, the joys never end. Thankfully, Central California was that and so much more. 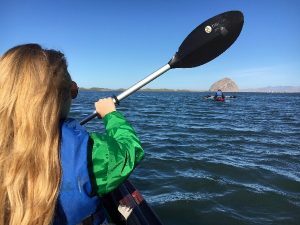 We leaned into our strokes, our kayaks carving across Morro Bay and onto the flanks of Morro Dunes Natural Preserve. In a flash, Hadley and Bode were gone. It took them a few minutes to resurface and I chuckled as I saw them jumping, rolling and skiing down each peaked dune. Since entering middle school, I’ve mourned that their childhood is slipping away but for this eclipse in time, they were kids again. Located halfway between San Francisco and Orange County, this untouched region in Central California is known for the dramatic Hearst Castle with the Pacific to the West, 100+ wineries in the San Joaquin Valley to the east and a smattering of quaint coastal villages in between. With the recent announcement of United Airlines’ direct flights from Denver to San Luis Obispo (SLO to locals), it’s more accessible than ever. 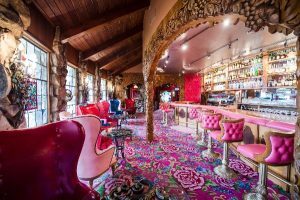 From the moment my friend Jennie told me her parents honeymooned at the Madonna Inn, “the quirkiest, pinkest hotel in the world,” my bucket list was formed. This outlandish landmark hotel in San Luis Obispo looks like the Mad Hatter was set loose in Casa Bonita with 110 themed rooms, a world-famous waterfall urinal and an onslaught of hot pink everything–carpets, marble, lamps and leather booths and their fluffy Pink Champagne Cake made with Guittard pink chocolate. Not everything here is sensory overload; located on 1,000 acres of coastal hills, you’ll find a serene horse pasture, the Secret Garden bursting with flowers and a European-style pool with a 45-foot waterfall. 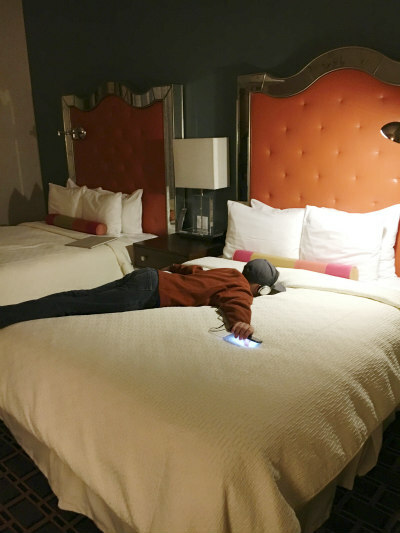 Our mantra was Go Big or Go Home so we blew half our travel budget to stay in the rooftop Sky Room, a two-story muted-blue family suite with textured white clouds and a carved staircase to the second level that looked down on flamboyant chandeliers. The real show-stopper was the bidet in the bathroom; potty breaks have never been so…refreshing! This 50-year-old kitschy inn shows signs of its age but guaranteed, it’s one stay you’ll never forget. Not far away, you’ll discover a gem among the historic Spanish California missions. Named after Saint Louis of Anjou, the bishop of Toulouse, the Mission San Luis Obispo is a must-see for history buffs. 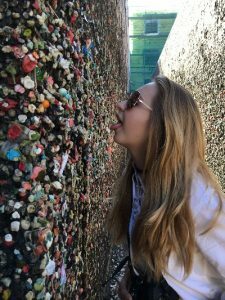 We stopped by the famed Bubblegum Alley in the heart of downtown San Luis Obispo for bubblegum graffiti that is every germaphobe’s worst nightmare and left our own sticky mark on this collective work of art. The city is home to Cal Poly and downtown SLO’s tree-lined streets, unique cafes and the Thursday night Farmer’s Market cater to that cool college-town vibe. I like my oceans like my mountains: wild, untouched and au naturel. San Luis Obispo’s quirky coastal villages and large stretches of the Pacific Ocean devoid of development are in stark contrast to the glitz and glam of California’s big cities. A local proudly told us, “This area is what Santa Barbara was 30 years ago and we want to keep it that way.” Even the tourists are different here and mostly consist of Californians or visitors passing through while driving the Pacific Coast Highway. We only had an afternoon tour of the Hearst Castle scheduled so our plan was no plan of all. 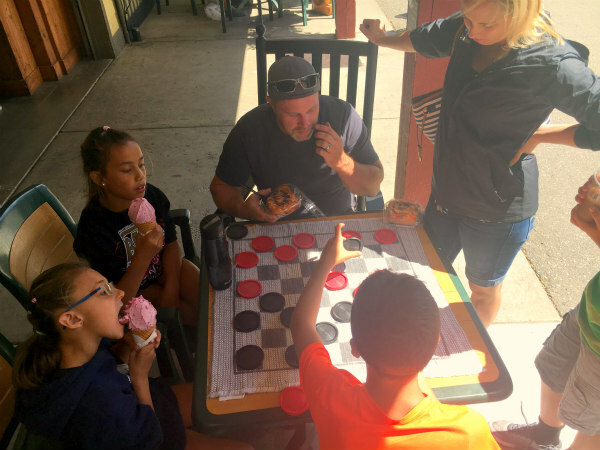 We drove north on California State Route 1 and soon stumbled upon Cambria, a seaside village nestled in the pines that was brimming with a brigade of 400 whimsical scarecrows for the Cambria Scarecrow Festival. And these weren’t just my genre of straw-and-farmer’s-clothing scarecrows. These were masterful works of art–Rip Van Winkle and cyclists with motorized wheels–a testament to this Victorian community that is teeming with artisans, unique shops, eateries and bed and breakfasts. 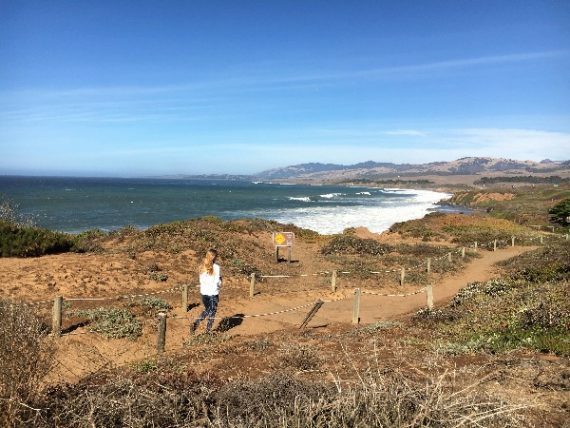 All the beaches in the 20-mile segment north of Cambria are part of Hearst San Simeon State Park with thirteen different beaches from Santa Rosa Creek on Moonstone Drive in Cambria to the southern Big Sur Coast. Many of them are hidden gems including Moonstone Beach’s brown sandy coves where you’ll find tide pools and semi-precious jasper stones of all colors. We followed the ridgeline, winding down to the beach where the wild spray elicited sheer glee. 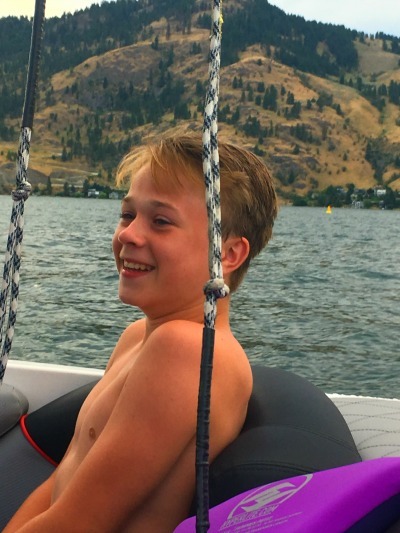 For land-locked kids, it doesn’t get much better than this. 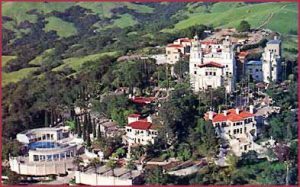 Hearst Castle is a National Historic Landmark perched above the clouds atop The Enchanted Hill. Built by publishing magnet William Randolph Hearst, this 165-room castle is a must-visit destination with various guided tours available. Our jaws were agape as we marveled at the opulence of his personal art collection and stunning architecture. The Refectory was reminiscent of the Great Hall of Hogwarts and its very own home theater broadcast (you guessed it) Heart’s news specials. 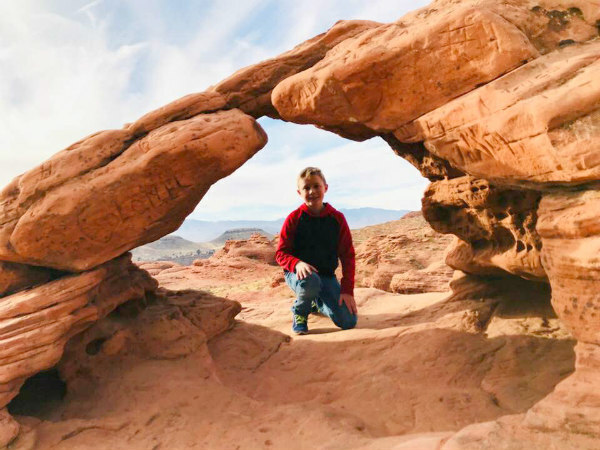 As we strolled the 127 acres of terraced gardens and fountains with wraparound views of the sunny Central Coast it was no surprise this is one of California’s most visited state parks. 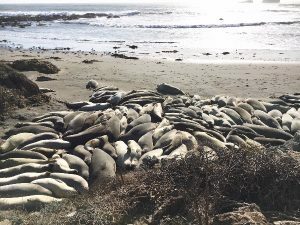 A mere four miles north of Hearst Caste on Highway 1, the Elephant Seal Rookery is home to about 15,000 Northern Elephant Seals that migrate thousands of miles twice each year where they breed, birth, molt and rest between trips. We chuckled at the laziness and middle-school drama between the seals but after learning about the perilous conditions they endure for 8-10 months in the ocean, they’ve earned it. Teenagers? Another story. We drove south and checked in to the newly redesigned and renovated 456 Embarcadero Inn & Suites, home for the next two nights. 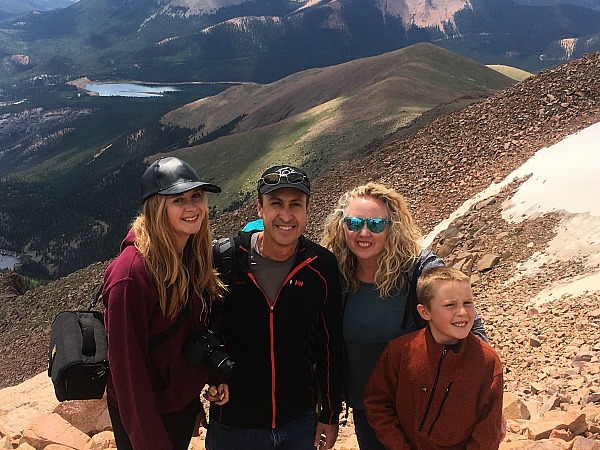 After the ostentatious Madonna Inn, this 33-room boutique hotel was a refreshing juxtaposition and we were delighted to learn its ties to Colorado–the owner spent a number of years in Durango. Our spacious two-bedroom family suite overlooked Morro Bay and the town’s quaint shops and eateries were all within walking distance. We fell asleep that night to the lull of the waves and the harbor seals barking at the yellow, gibbous moon. 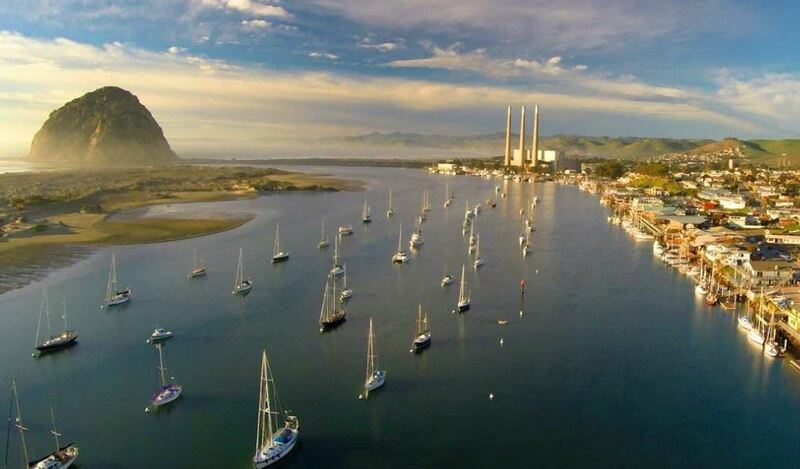 Morro Bay is best known for Morro Rock, an ancient volcanic mound that stands sentry over Morro Bay State Park, home to lagoons, trails and a bird-rich saltwater marsh. The next morning, we met John Flaherty of Central Coast Outdoors for our half-day guided kayaking tour. Locally renowned for his kayaking, biking and hiking tours of San Luis Obispo, Big Sur and the Central Coast, we were in good hands. 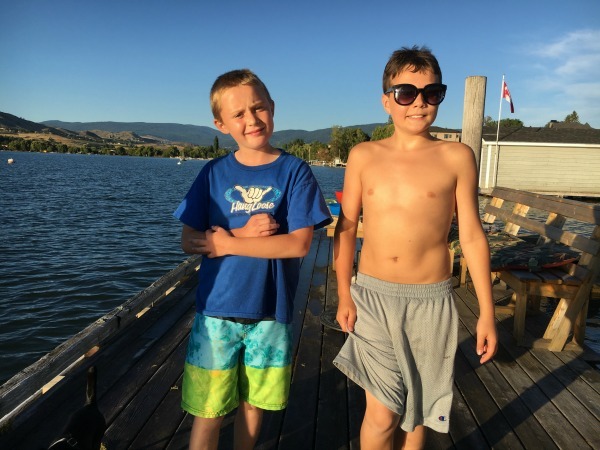 Though we love our annual trip to Lake Okanagan, a week-long stay is a bit too long for me (disclaimer: I start to get the most antsy when it is 100+ degrees, which isn’t super fun when the house is sweltering). However this year we only had four nights and five days that I discovered was way too short. So, here’s for hoping we find our happy medium. It’s taken me quite a few years to acclimate to the water. It’s amazing my brother Pat and I are even related given how obsessed he is with boating because we never grew up around it. 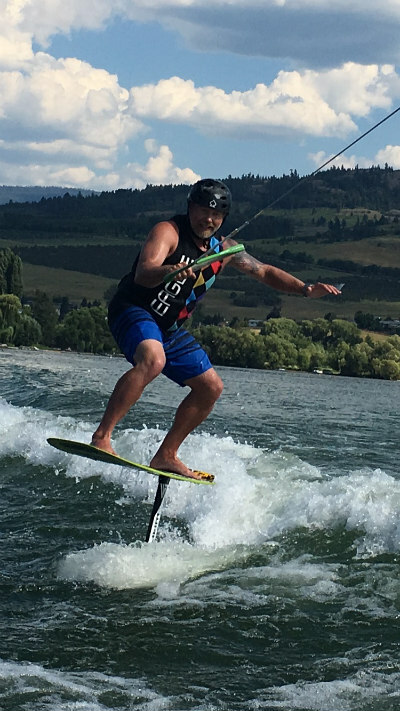 He just bought a fancy fifth wheeler that is parked at Keho Lake for optimal kiteboarding opportunities and travels the world seeking the next big adventure. 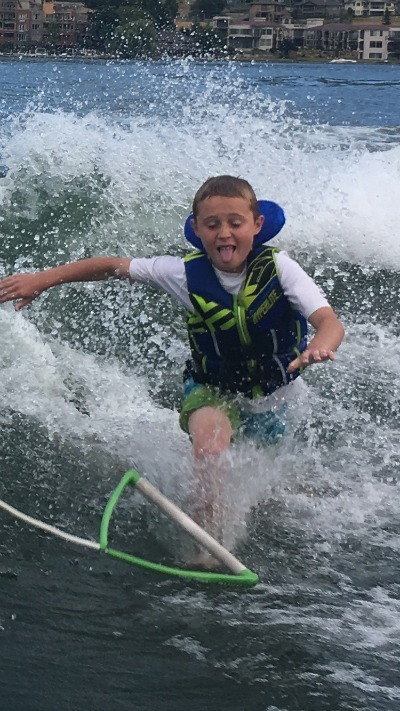 This year was a milestone for our family: we were all able to wakesurf on our own and we loved it! Bode tried last year but needed help getting out of the water from Jane. 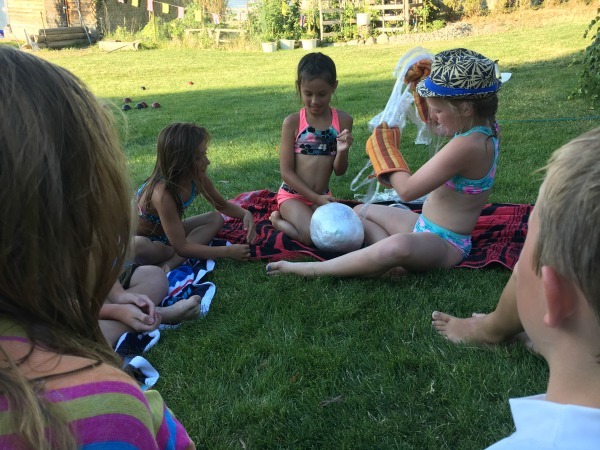 They purchased a new kid-sized surfboard and that made all the difference. So dang fun! 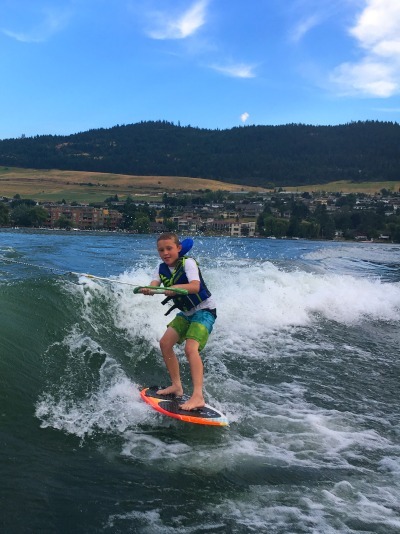 The kid even learned to walk on water. Jamie and I hate to admit it but Hadley surpassed us out there. 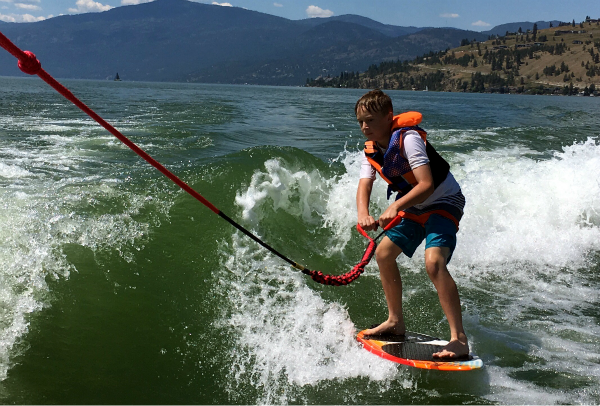 By the end of the week, she was able to drop the rope and was figuring out how to ride the wake. I wish she had more chances to go because she could be really good. Jamie did pretty darn awesome as well. We were at the same level all week and on the very last run, something clicked and surfed better than he ever has. 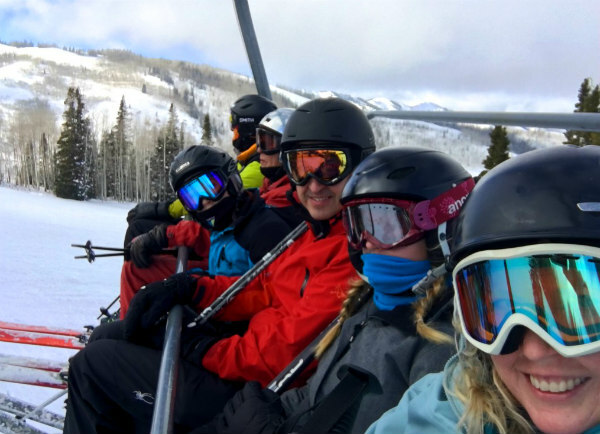 Note: This happens to us every ski season as well…your skiing is at its very best on the last day and then we have to wait for the following year. Of course, there is always this. 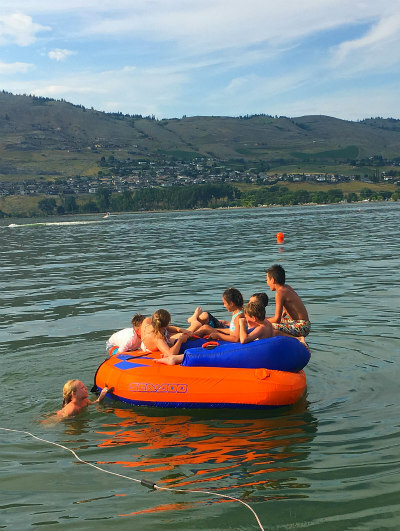 Tubing: It’s not for grownups. 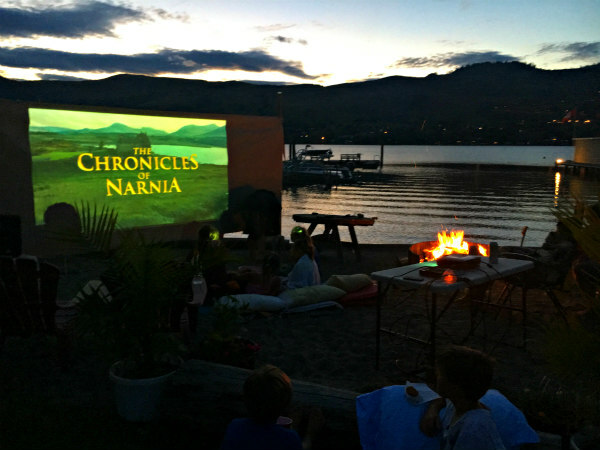 The only traditions we weren’t able to fit in were Screamers (part slushy, part ice cream) and backyard movie night on Todd’s beach because massive flooding completely took out his yard. 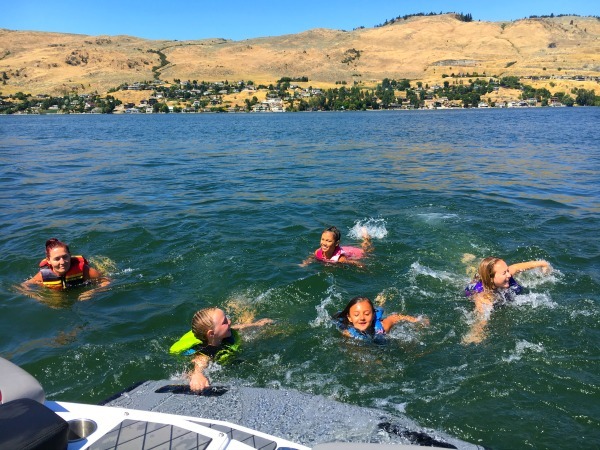 And we added some new ones: Ashton and I did an “Olympic swim training” and by the last day, several of the kids had joined in. Of course, there was the annual dive-off. Yes, Pat won AGAIN. 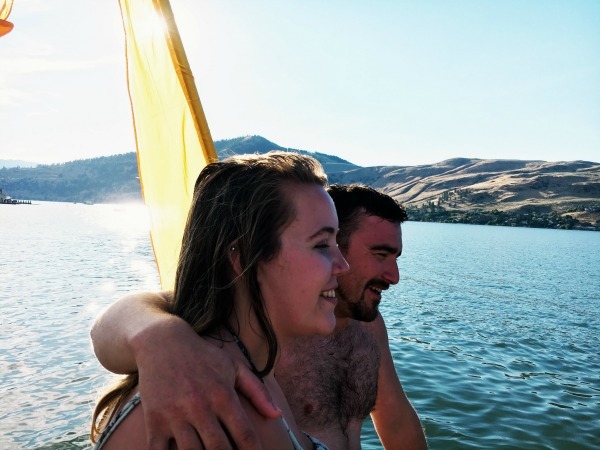 My niece Emily brought her beau to the lake: Jer the Irishman. He almost died during the dive-off but no judgment here; I won’t get my face wet. 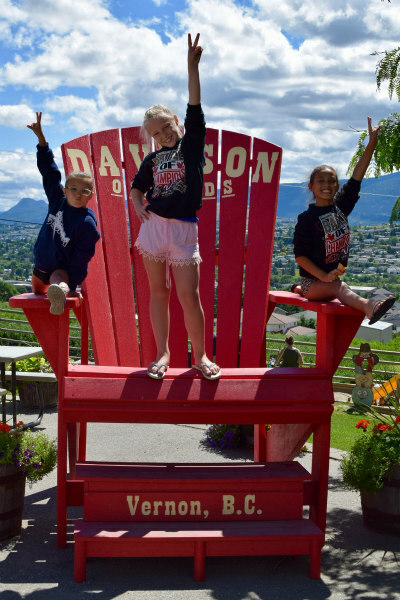 Of course, we had to go to tourist trap Davison Orchards for their out-of-this world fresh apple slushies, peach pies and fuuuuuudge. And lots of quality cousin time. After such a memorable week at play, maybe just maybe Pat will make water people out of us all. Here’s to next summer at the lake! 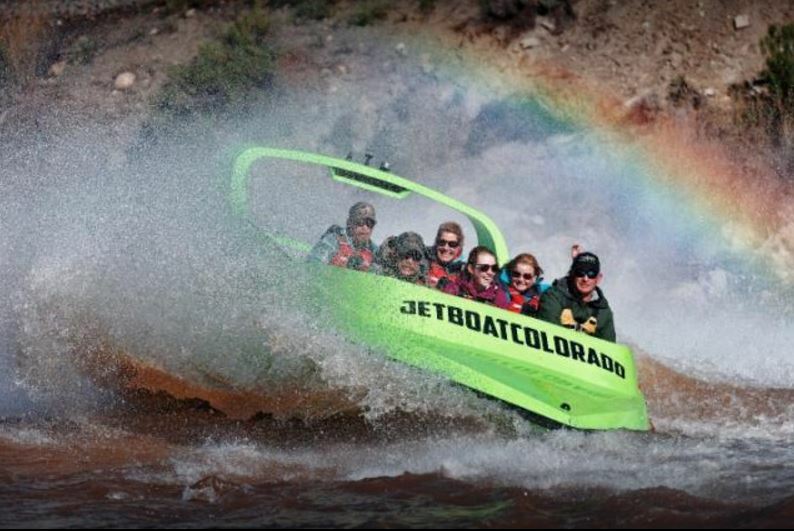 I wouldn’t say I “feel the need for speed” but as we raced across the Colorado River with Jet Boat Colorado, I sure did like it. A lot. 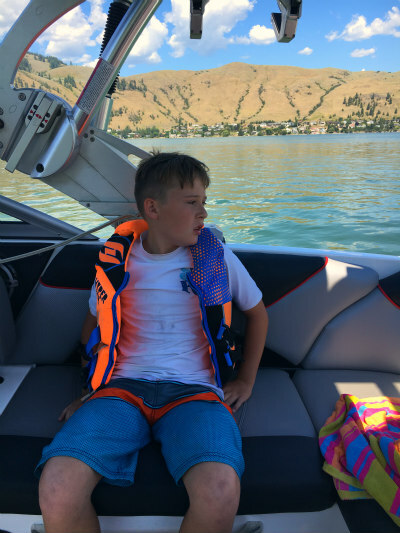 I had never heard of jet boating until a friend went to New Zealand last year and posted a video of her 45 mph adventure through narrow canyons as their boat barely skirted the banks of the river. I never dreamed I would have the opportunity to try it out myself until I learned Jet Boat Colorado offers Coloradoans the same adrenaline-charged adventure as our Kiwi counterparts on a slice of the Colorado River outside of De Beque, a historic community nestled near the Roan Plateau and Grand Junction. The perfect end to the perfect week in Colorado was three days of perfection at The Broadmor. And there’s no better way to kick off Said Perfection by dining in the 5-star Penrose Room after a grubby week of getting dirty in the backcountry. 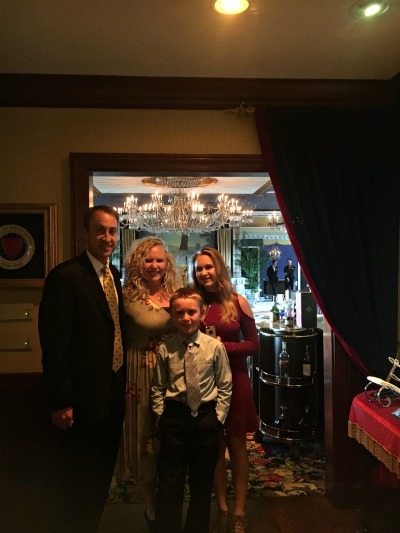 Fortunately, we clean up nicely. Early the next morning, I went for my traditional solo hike up North Cheyenne Canon and raced back to get ready to The Broadmoor’s fabulous brunch. Bananas foster. Shrimp diablo. Plum Calvados Crepes. We take our brunching very seriously and Hadley went into panic mode after round 3. “I don’t know what to get now….I feel so empty inside…oh wait, I’m rather full.” These are true First World Problems, people. One of the highlights of visiting in the summer is renting a cabana by the pool and almost without fail, rain always interferes with our plans. Fortunately, we were able to soak it all in for 1.5 hours before calling it quits and taking a nap in our rooms. 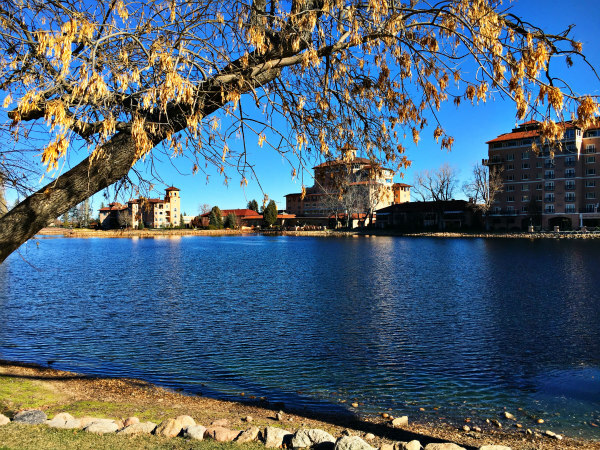 We are all obsessed with The Broadmoor but no one more than this guy. 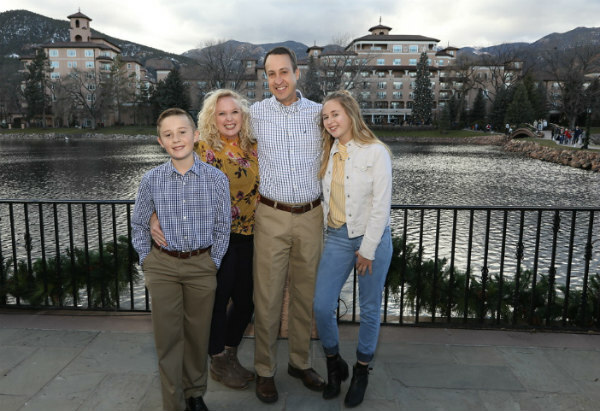 Every other restaurant or hotel pales in comparison as he sputters out “This would never happen at The Broadmoor,” which means 99.9 perent of his life is a disappointment. 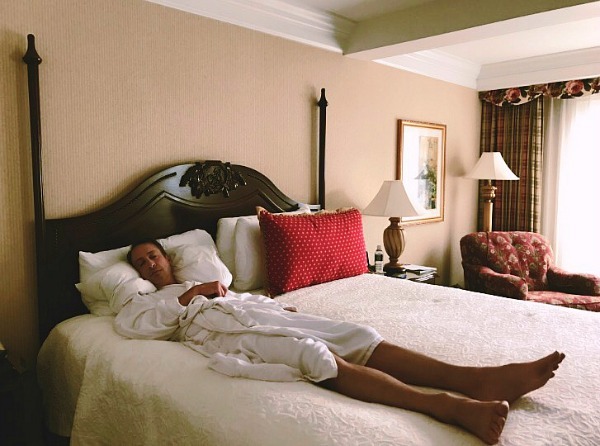 I found him napping like this in his luxurious robe that afternoon. At least 0.1 percent of his life is bliss. 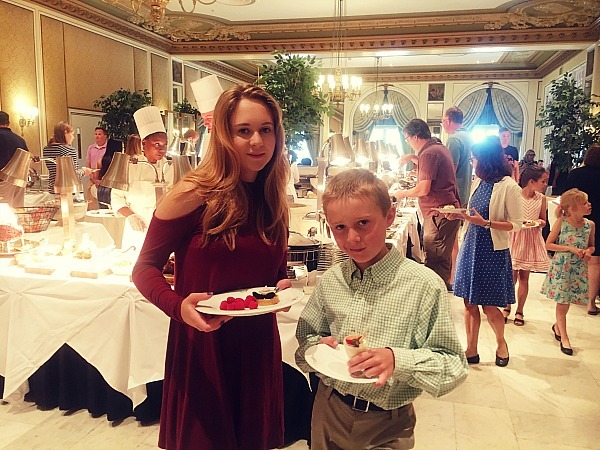 That evening, we dined at our favorite restaurant, The Summit, followed by bowling at Play at The Broadmoor. 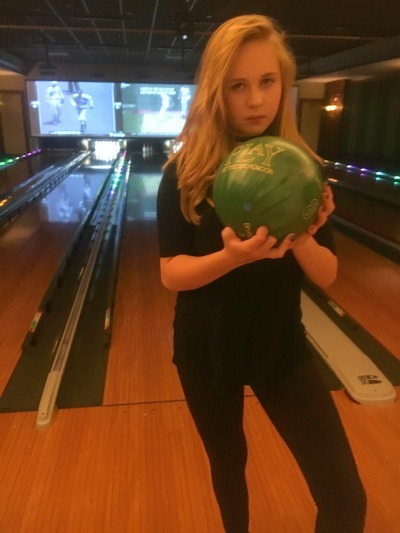 I was worried how Hadley would do with her broken arm but she bowled her first strike ever, thereby proving that maybe having a handicap can actually be helpful. 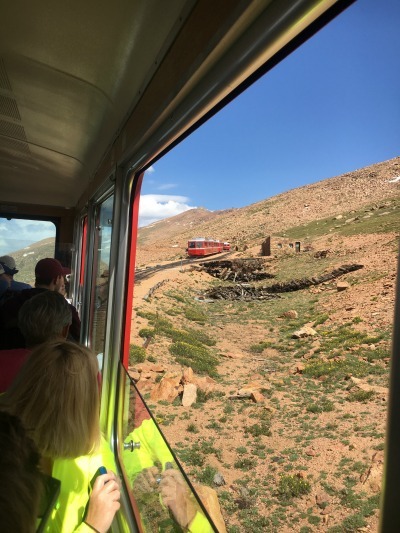 The next day, we had one of Colorado’s most epic experiences via the Pikes Peak Cog Reailway! 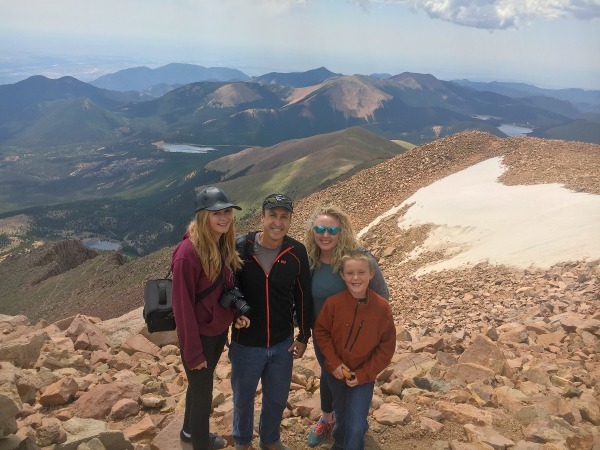 I’ve climbed several 14,000-foot peaks but nothing can quite prepare you for arriving at the summit of 14,114-foot Pikes Peak via the world’s highest Cog Train and being greeted by an onslaught of out-of-shape tourists. 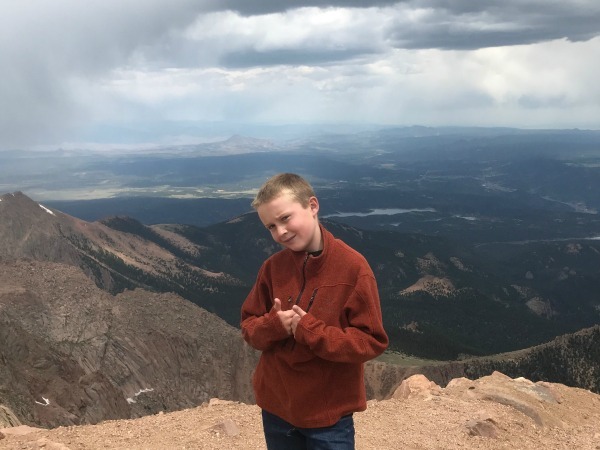 If you can’t beat ‘em, you’d better believe we joined ‘em by eating fresh doughnuts and relishing the views from the summit. 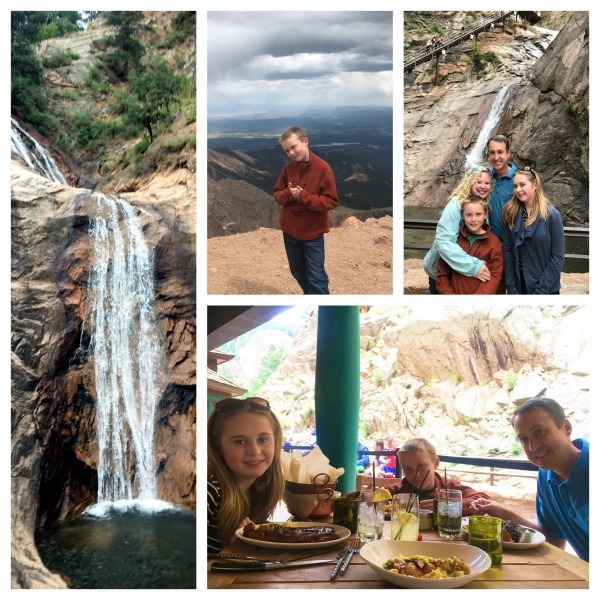 Later that evening, 10 days of beautiful Colorado scenery overload was capped off by Seven Falls and delicious dinner at The Broadmoor’s 1858 restaurant. As I looked across the table at these exhausted, happy people, my heart was so full. We may not always be at our best at home but when adventuring, we shine as our best selves. And it makes all those painful road trips when they were younger to see the avid travelers they have become. We couldn’t agree with you more.